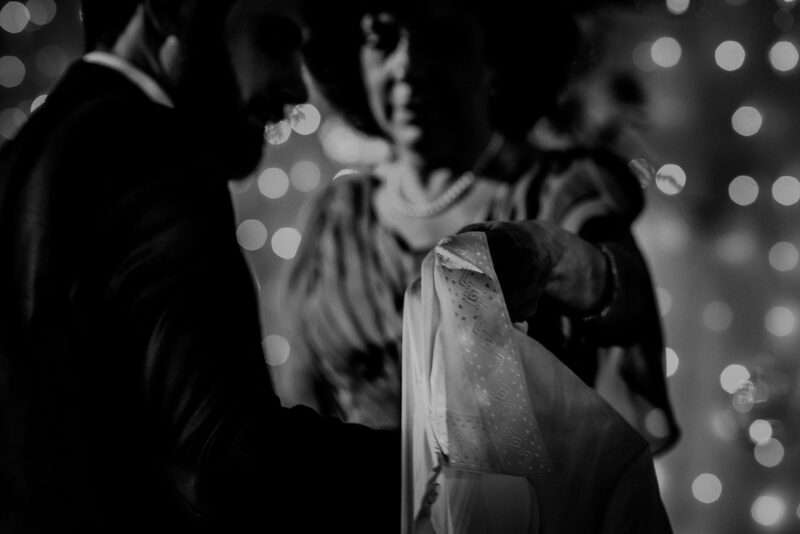 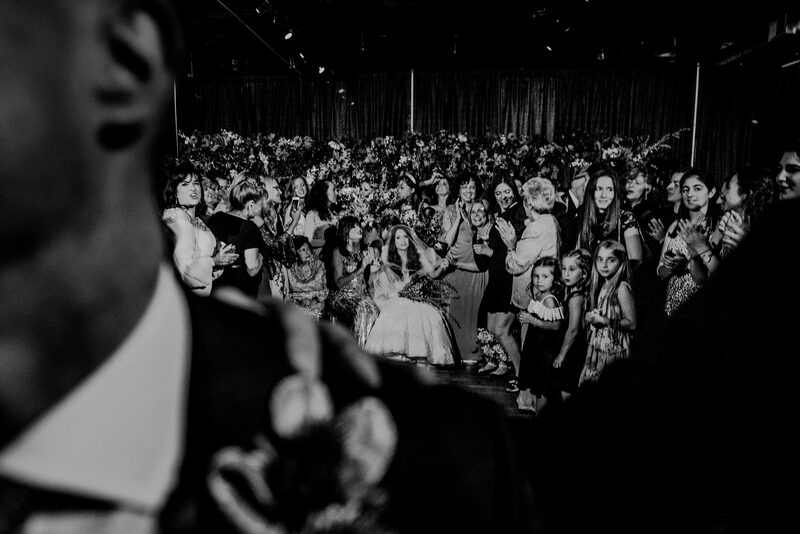 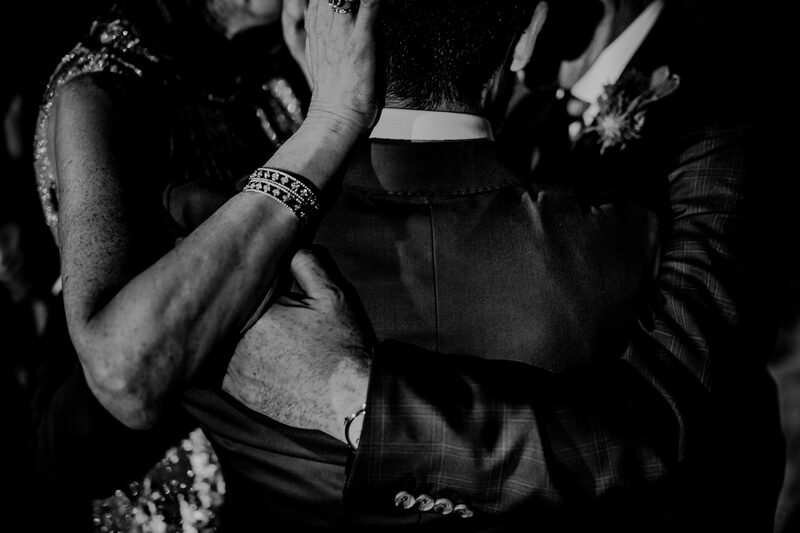 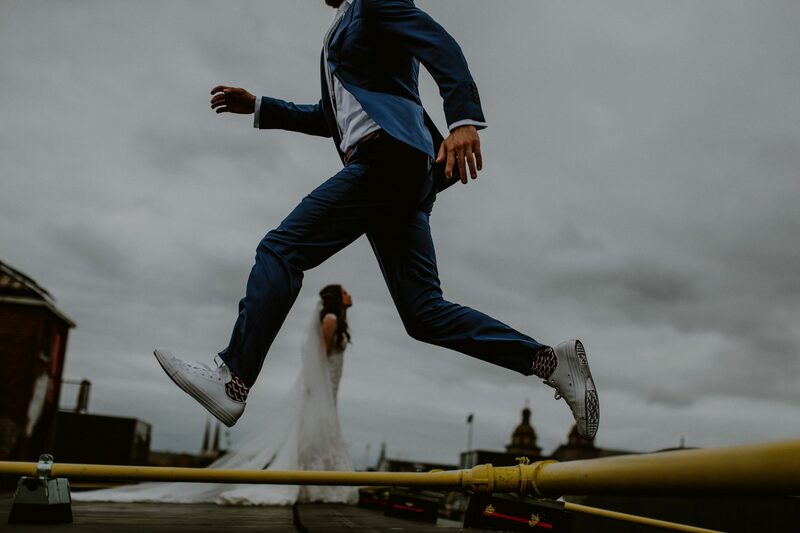 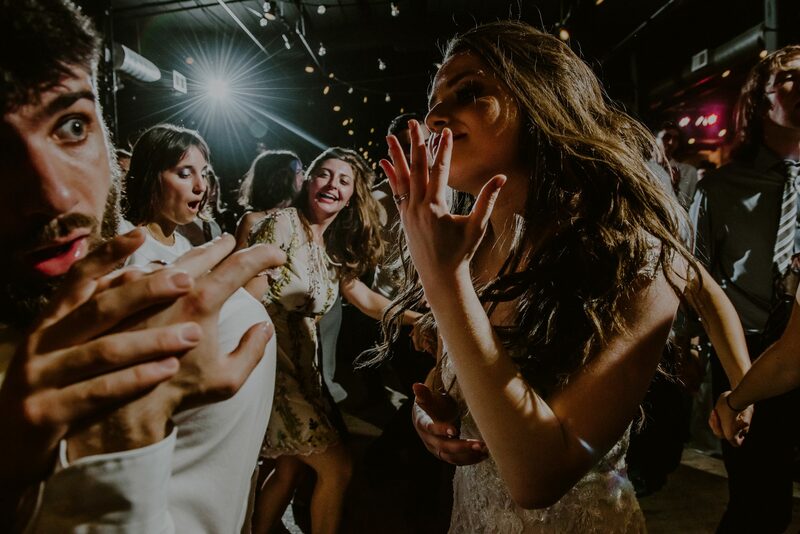 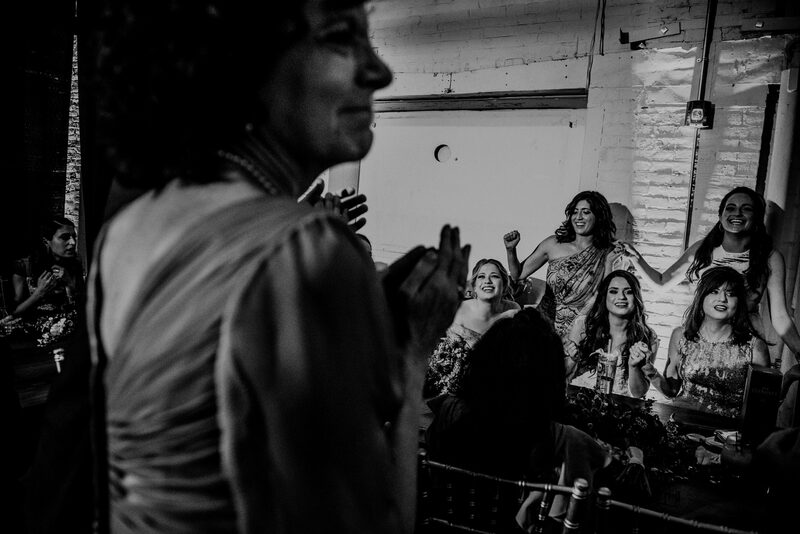 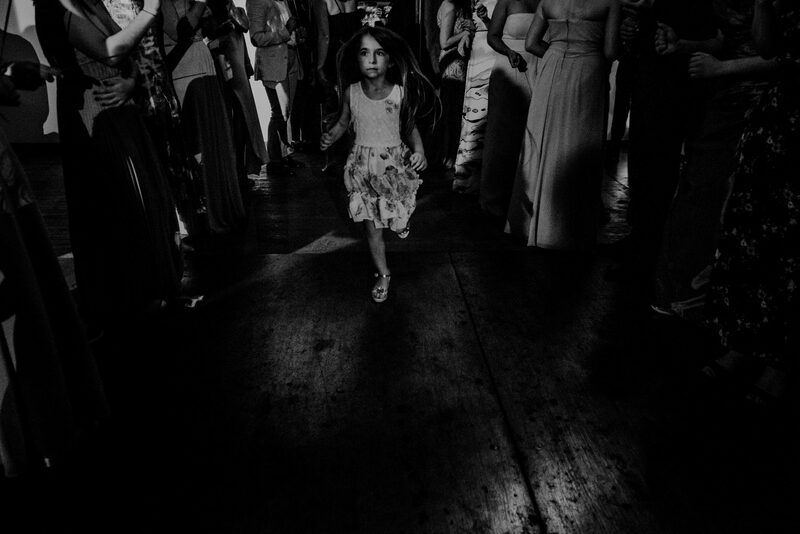 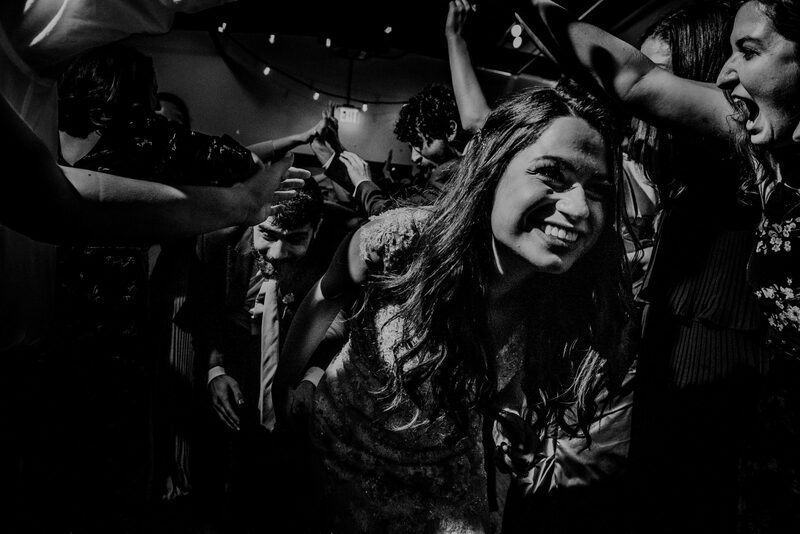 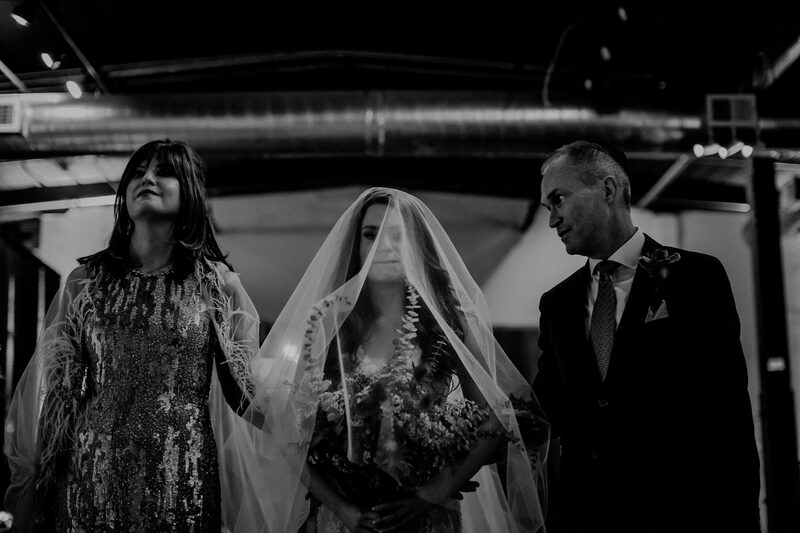 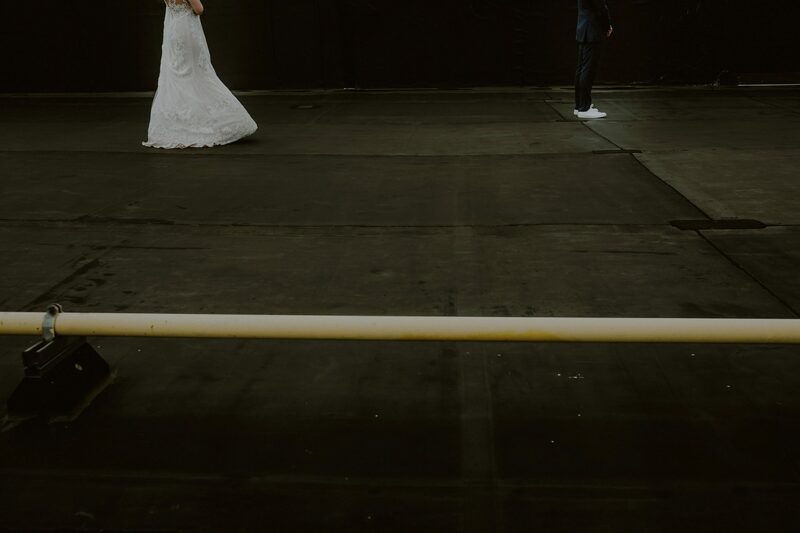 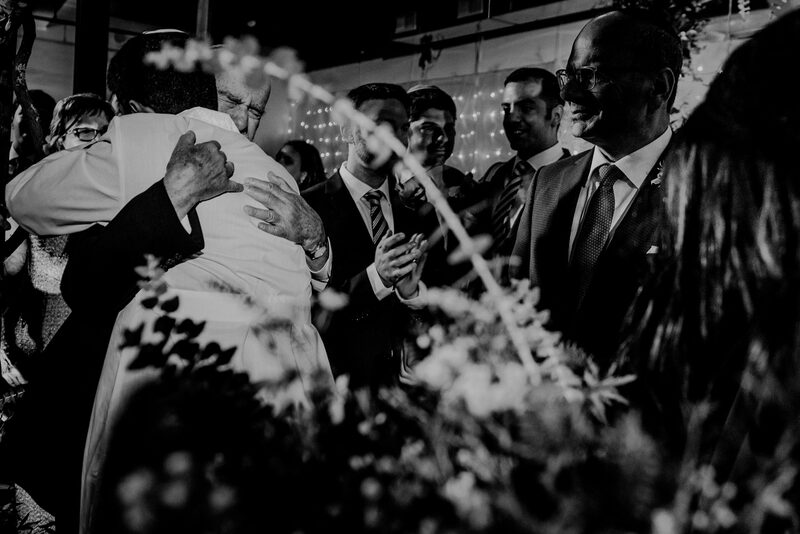 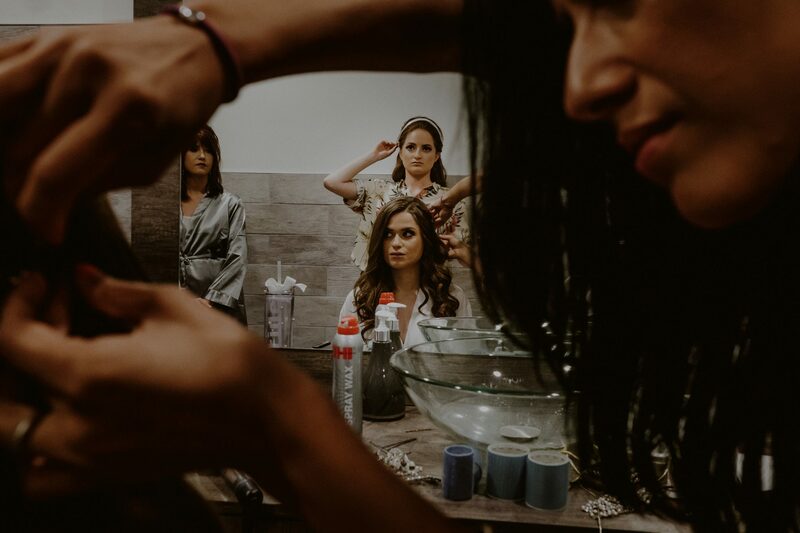 A Factory 220 Wedding in Passaic, NJ // One of the things that I strive to accomplish in every wedding is to capture the energy and emotions of the day. 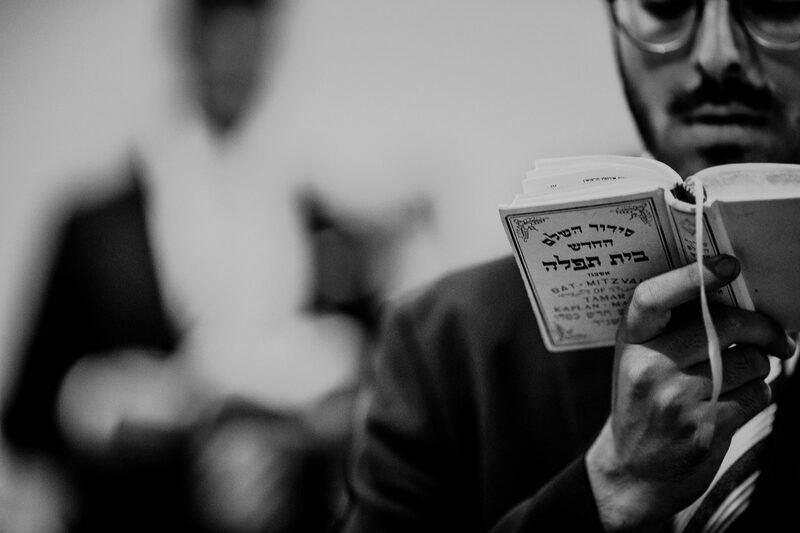 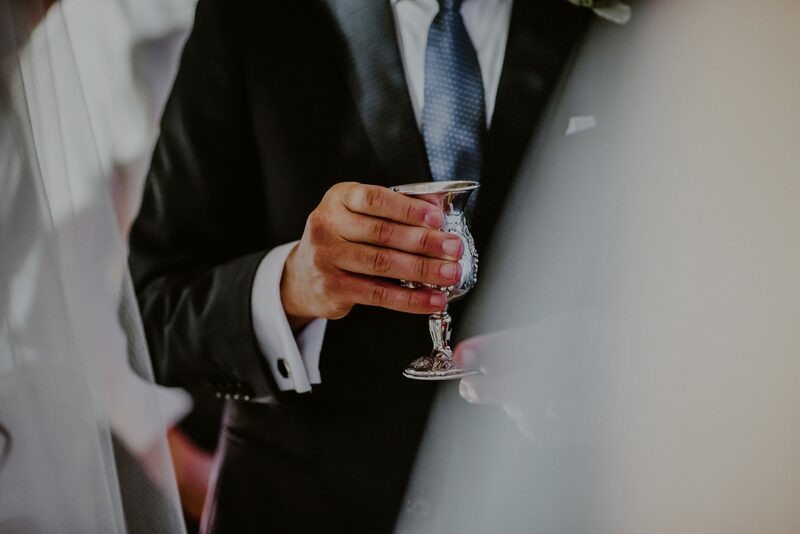 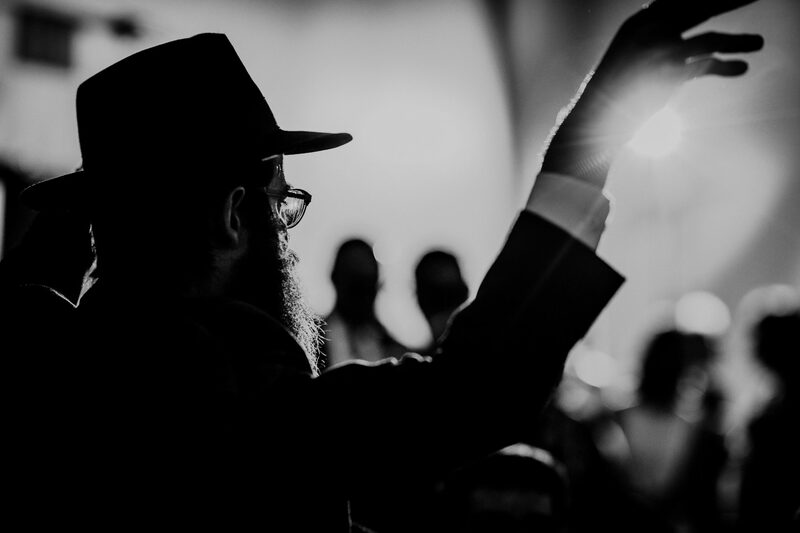 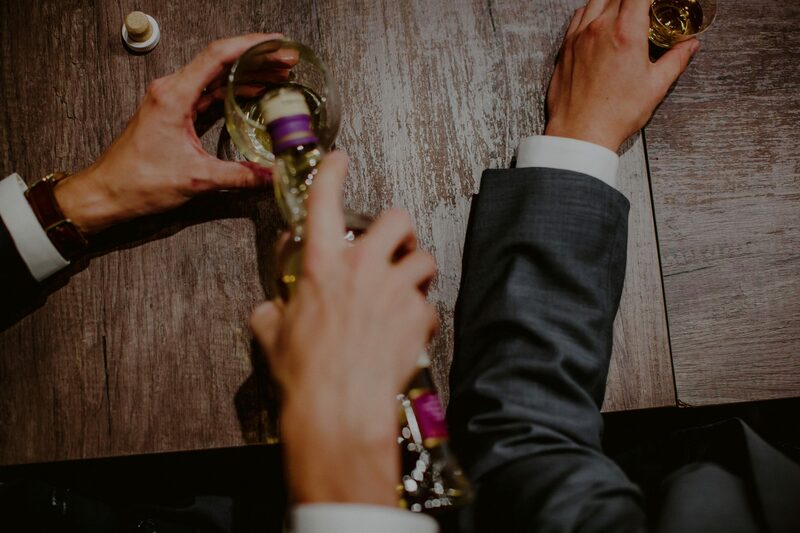 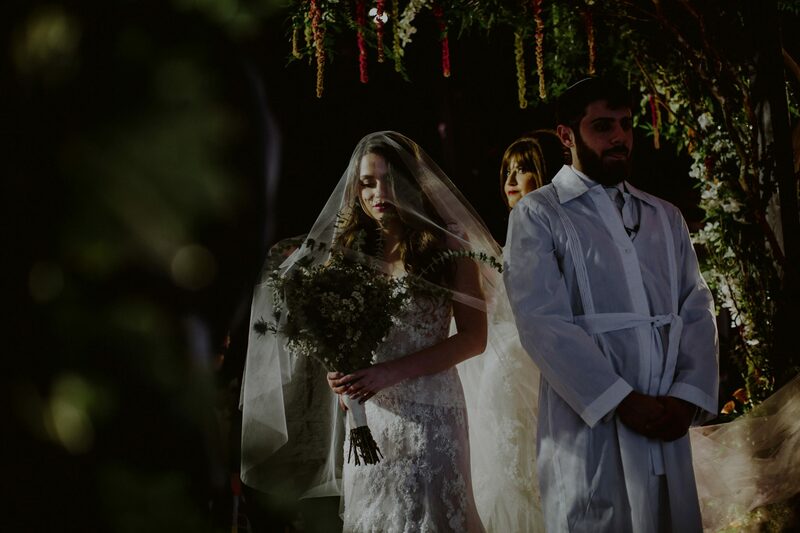 If you know an Orthodox Jewish wedding celebration, there is lots of that going around! 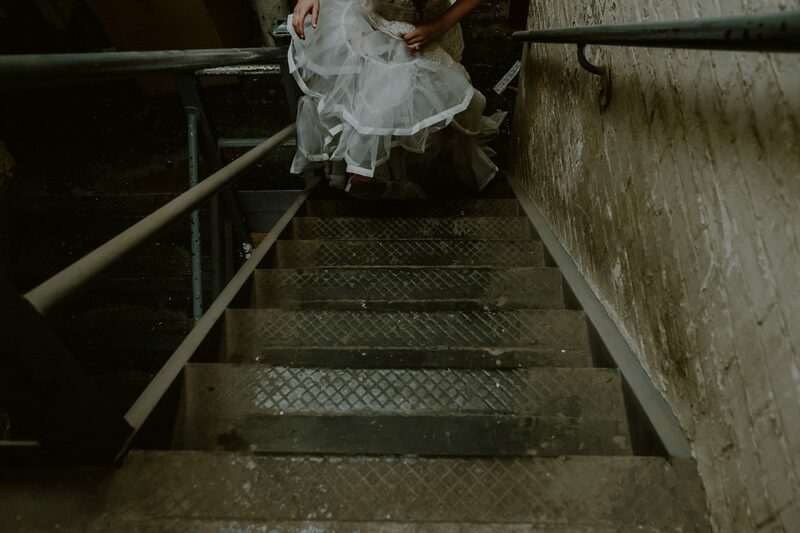 You’d think it’s easy, because it’s all around you. 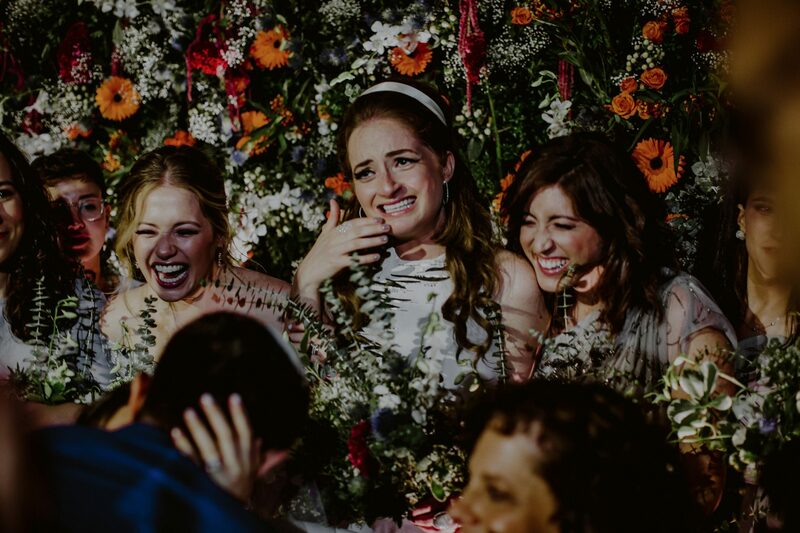 How could you not be consumed by the sheer joy of everyone around you. 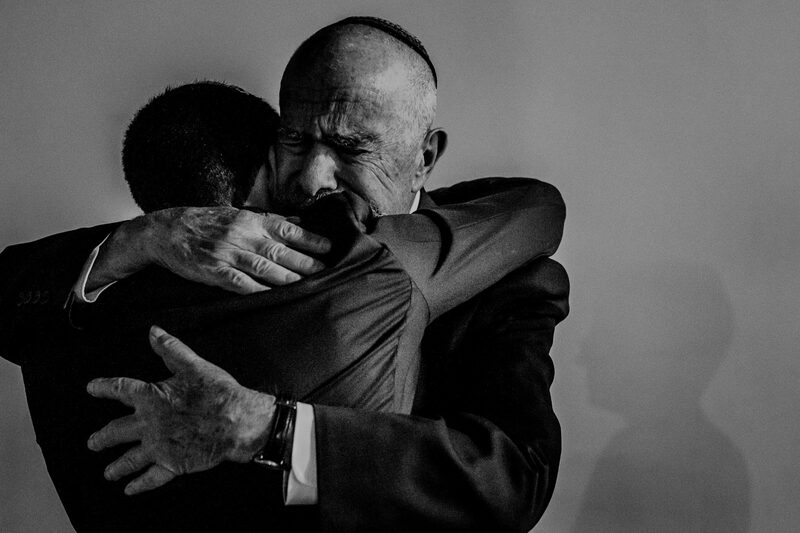 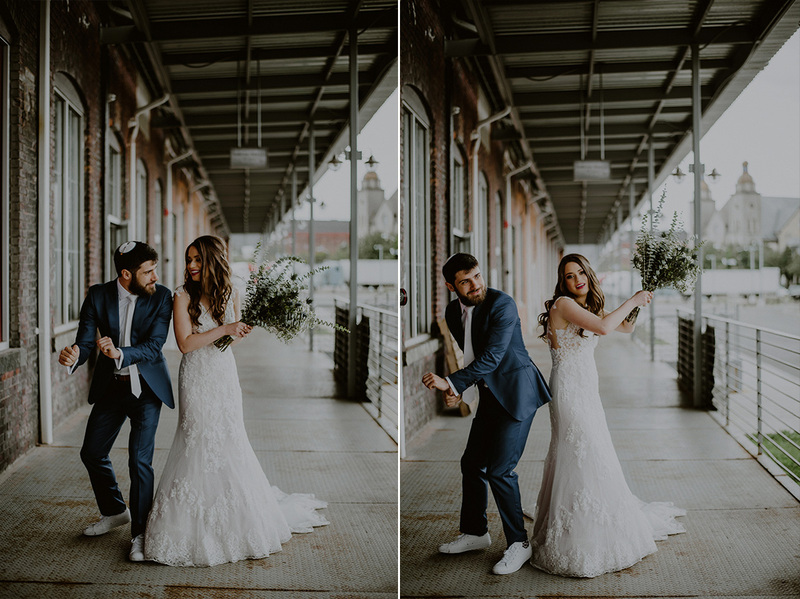 The passionate celebrations and traditions that have been carried through generations, adapted throughout the years, are the most fun to photograph. 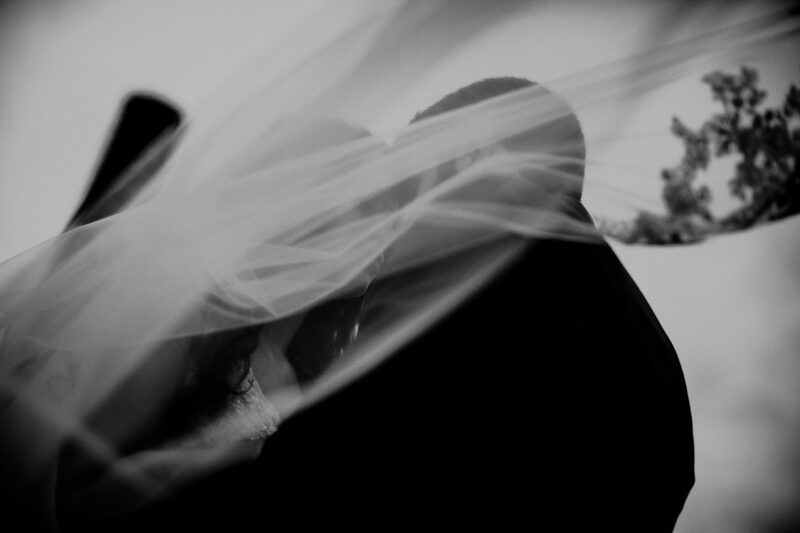 It was easy in that sense. 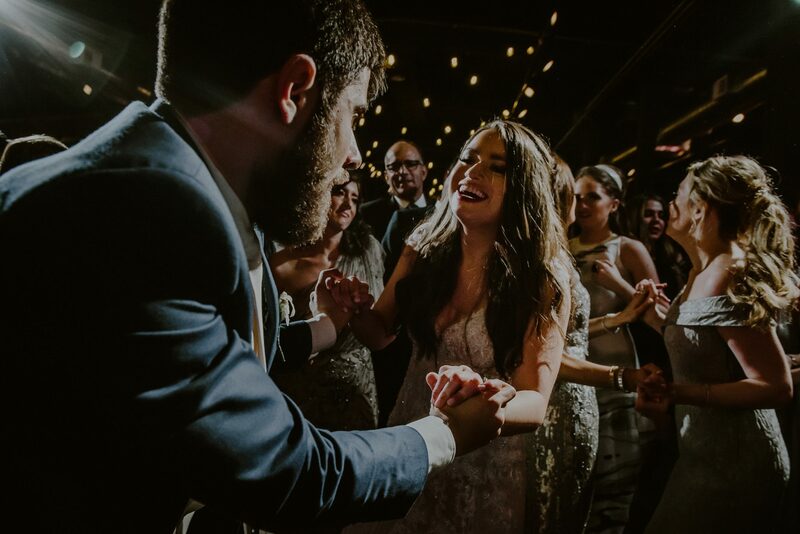 It was easy to feel those palpitations through my chest of the music, the vibes, and the pure love in the room for these 2 people. 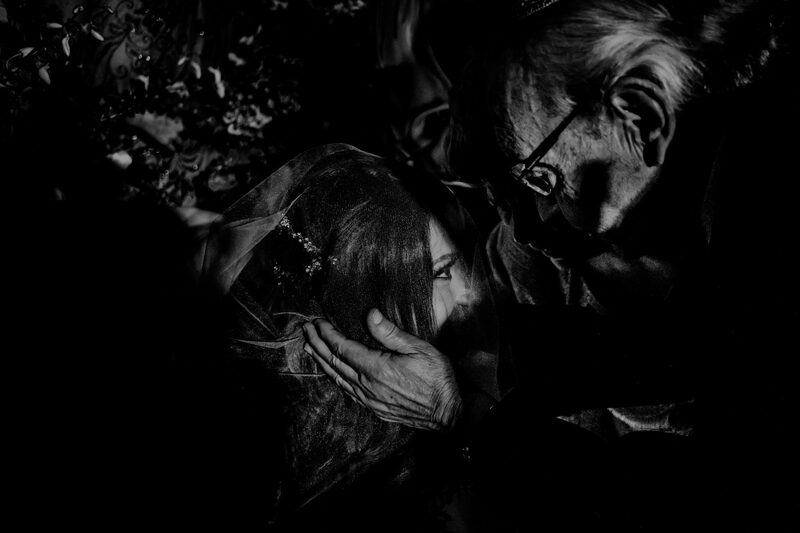 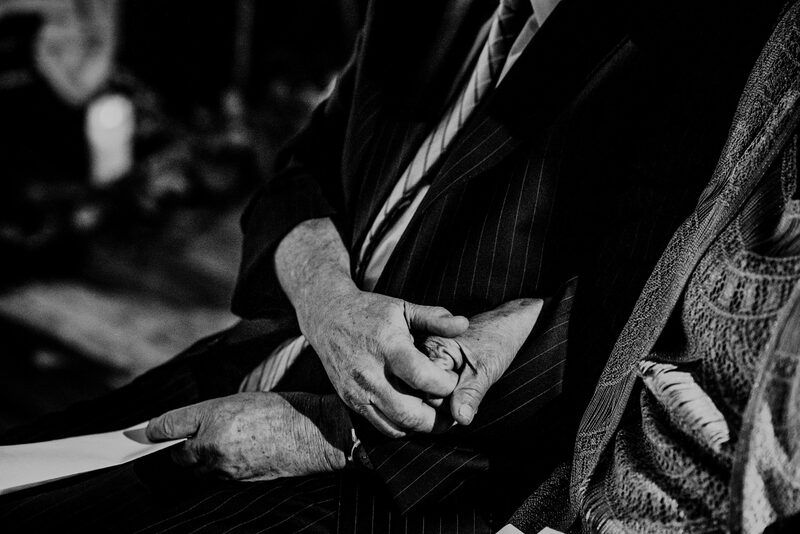 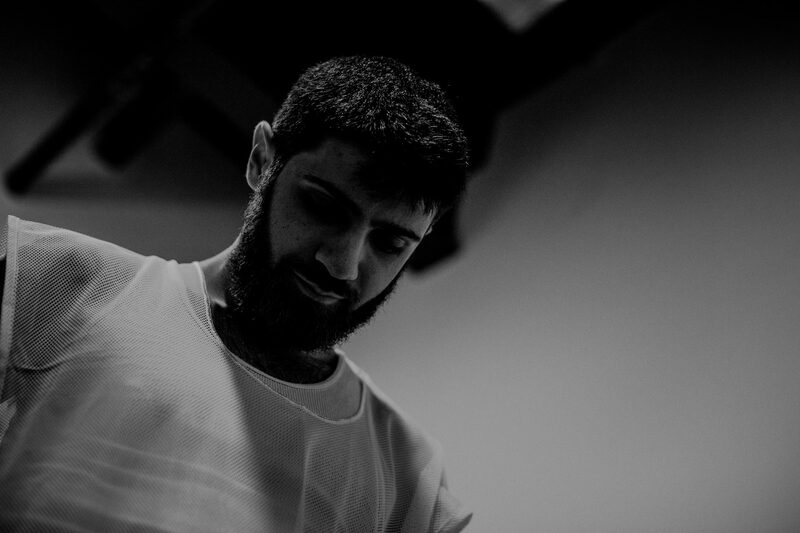 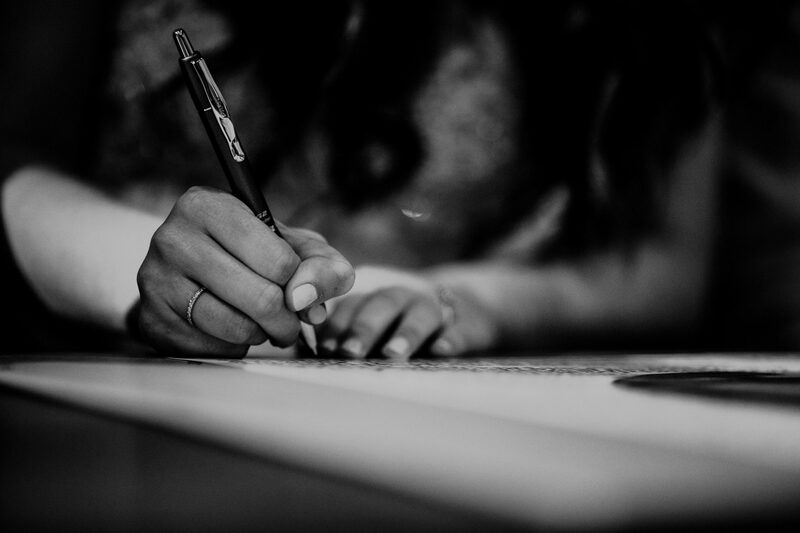 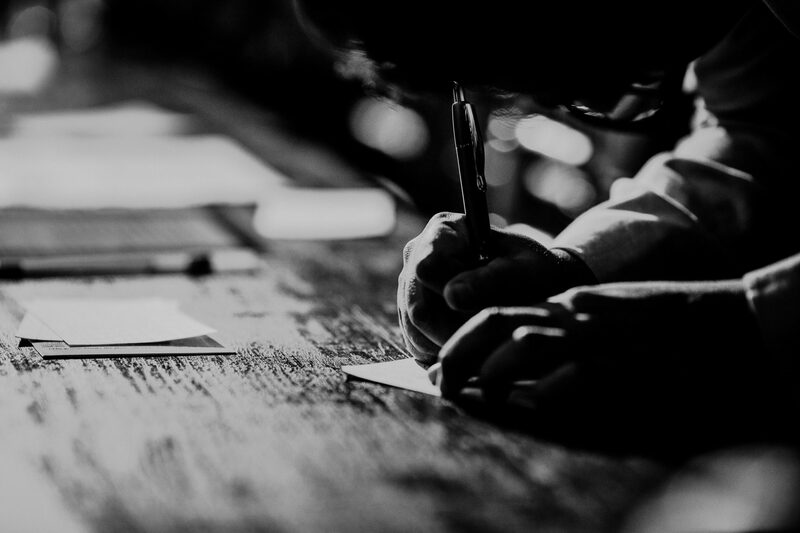 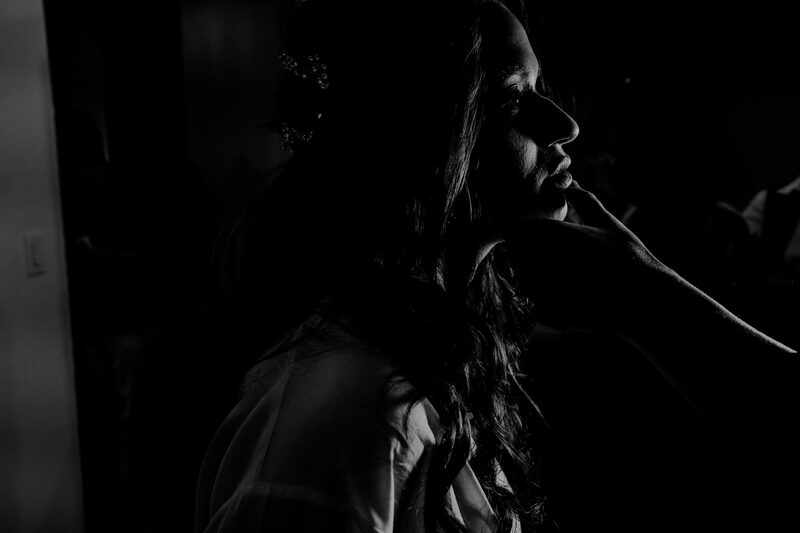 The hardest part, and the part that I hope to achieve with these images, is conveying that intense feeling back to you. 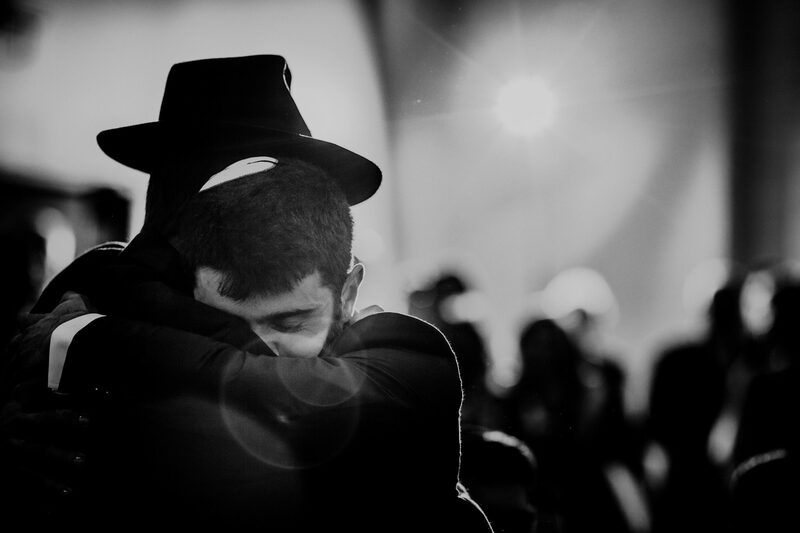 It’s a feeling that can only be felt by being there! 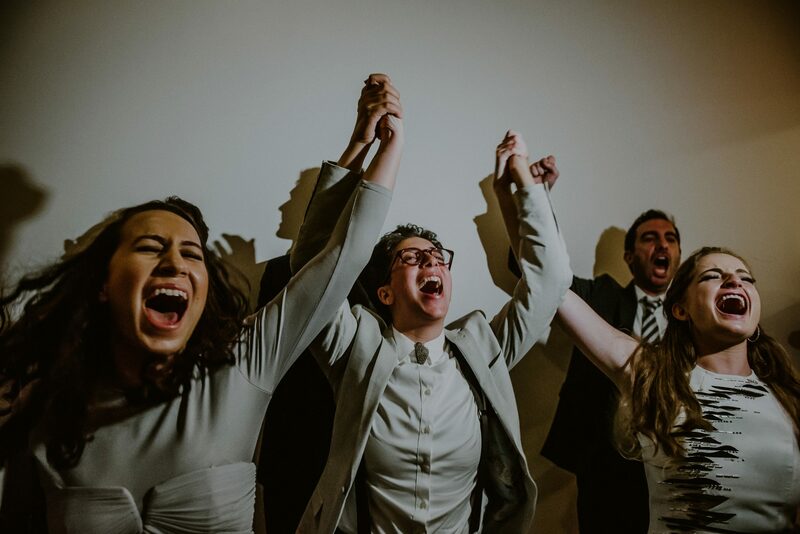 I absolutely knew that Allie and Aaron and their families were going to bring it to their wedding day. 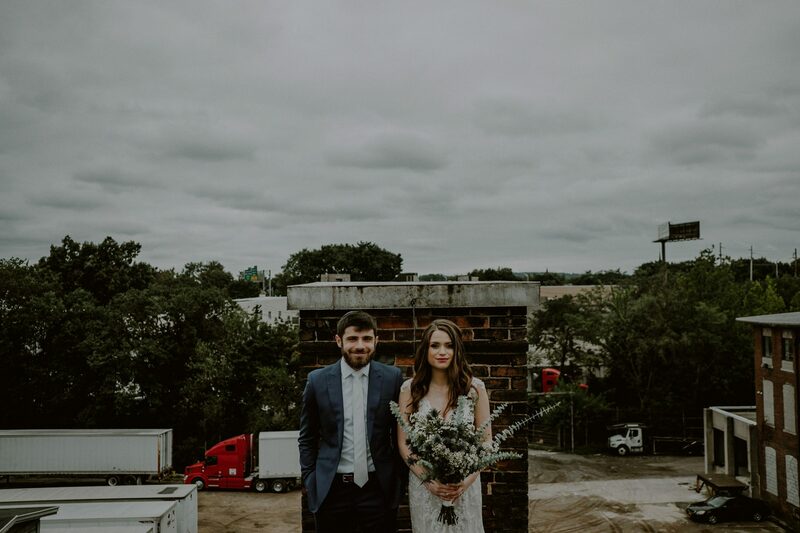 I met them at their apartment over the summer to photograph their in-home Brooklyn engagement session. 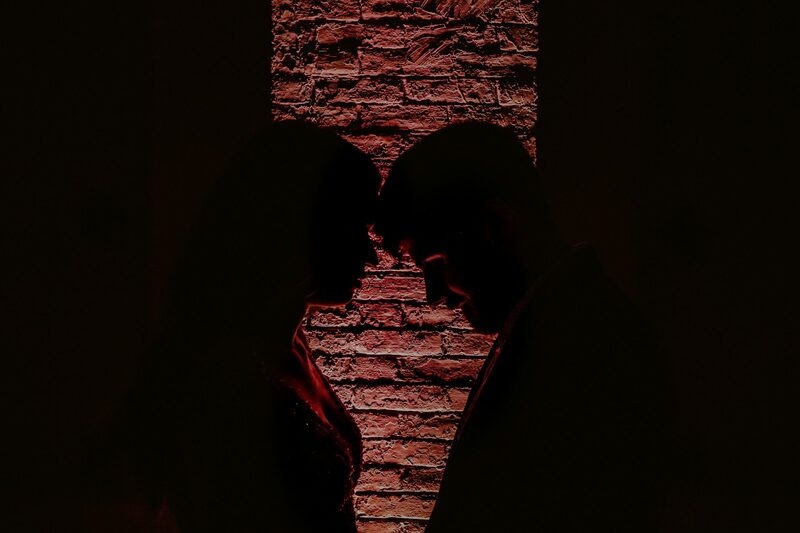 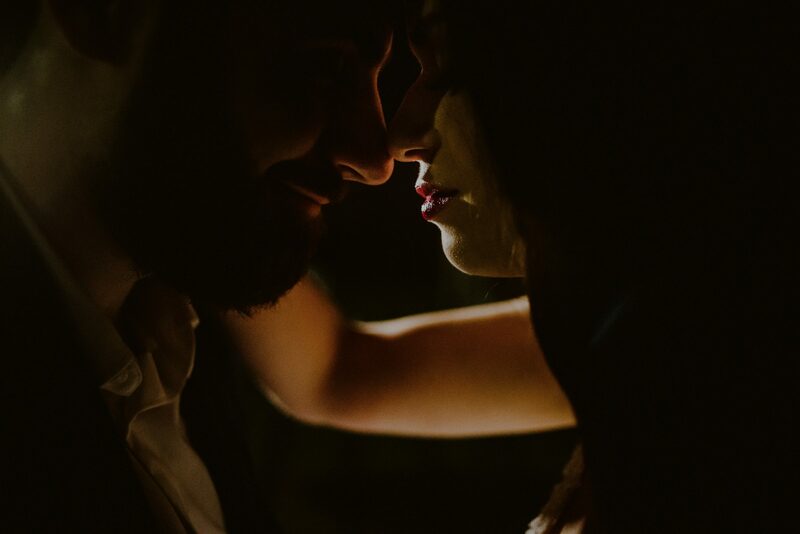 It was an intimate and fun couple of hours that gave me a perfect glimpse into how attached at the hip and meant-for-each-other these two are. 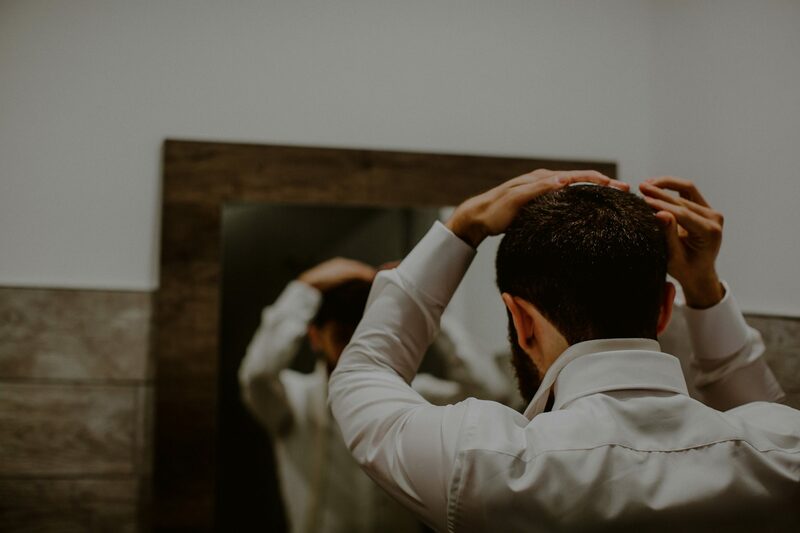 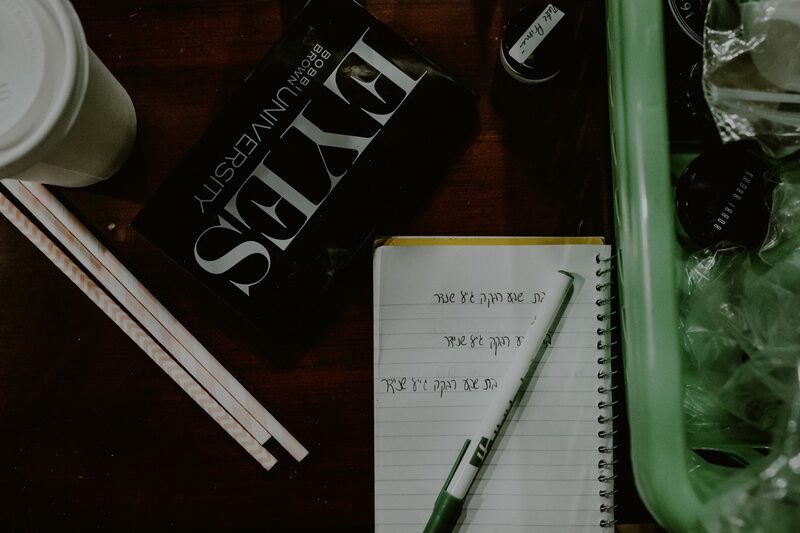 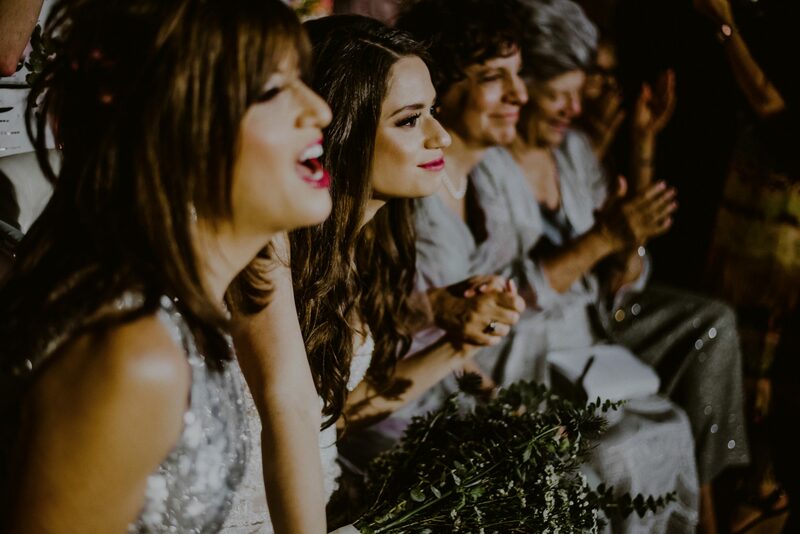 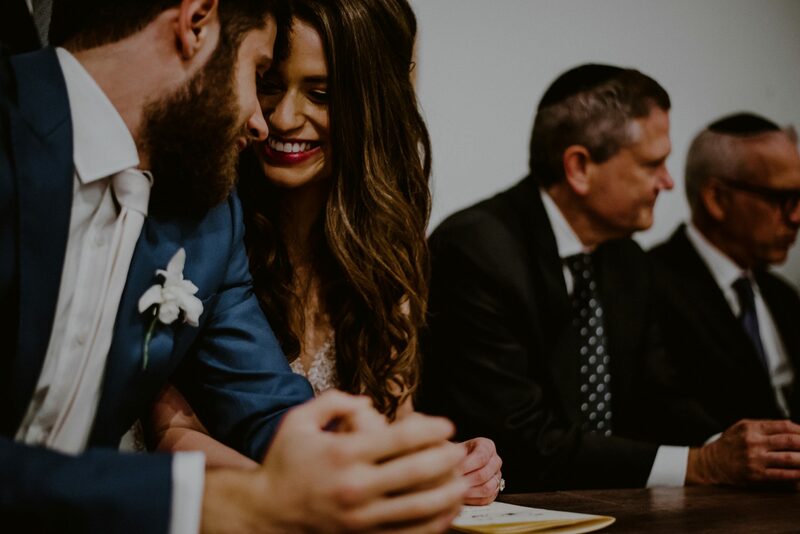 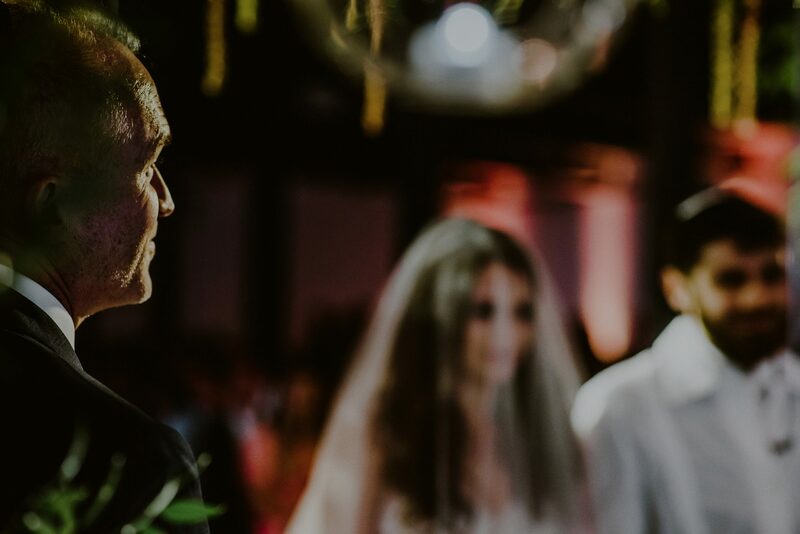 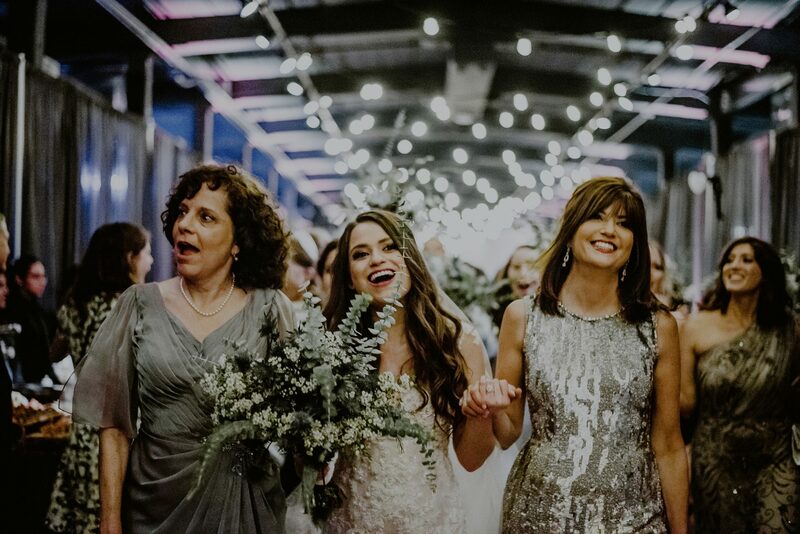 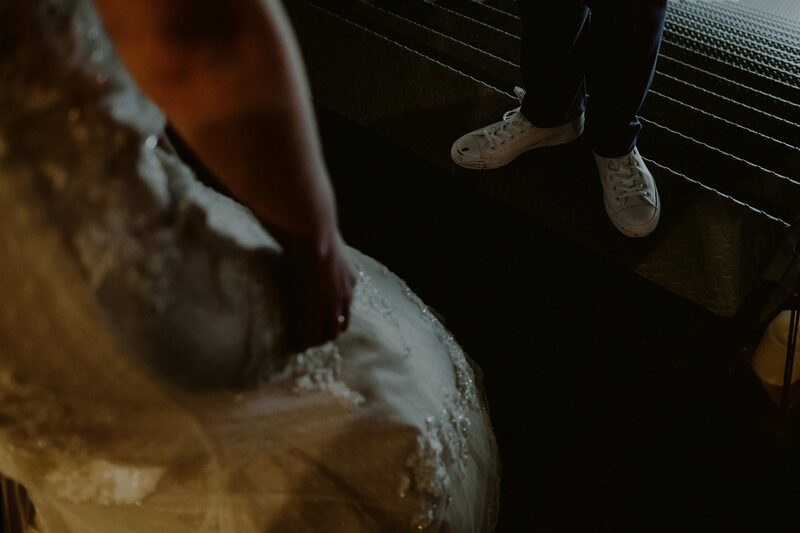 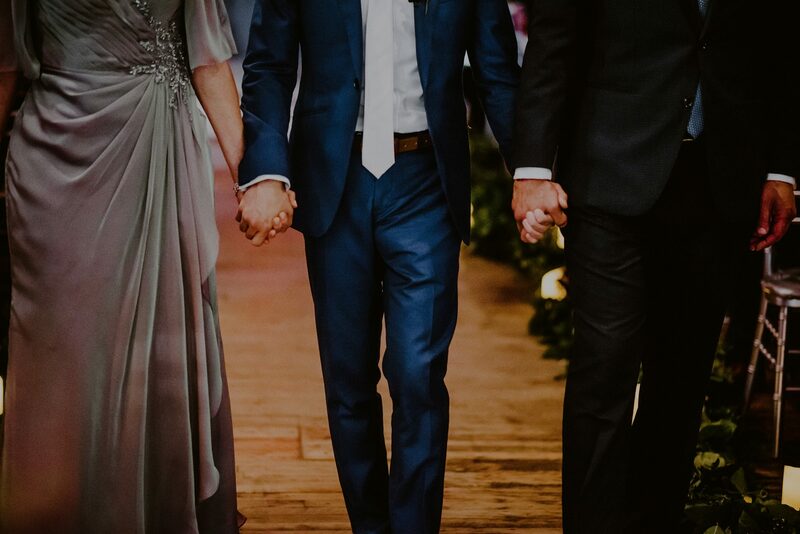 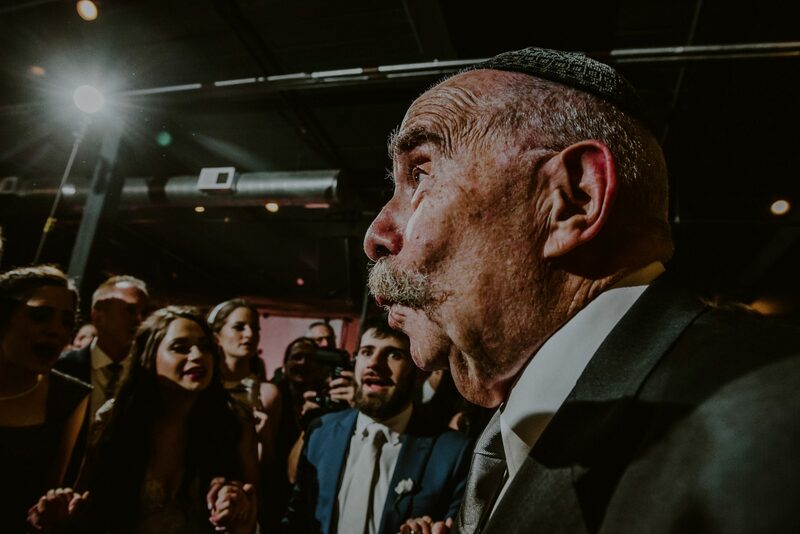 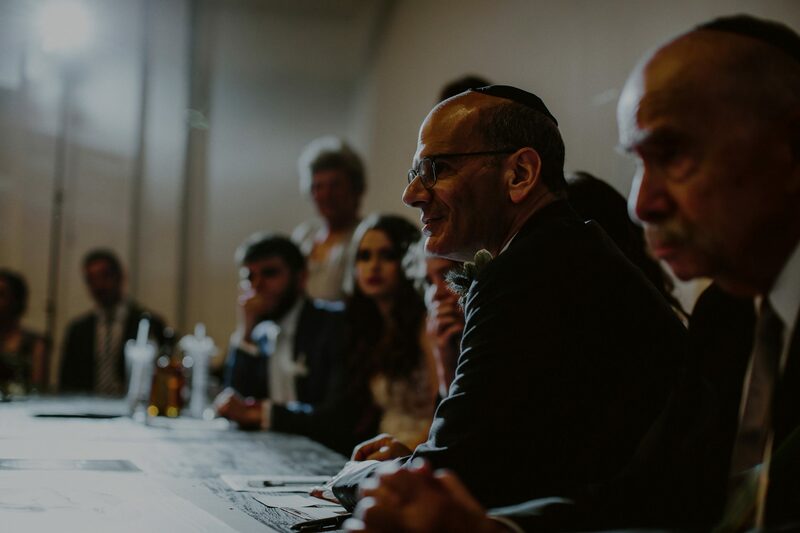 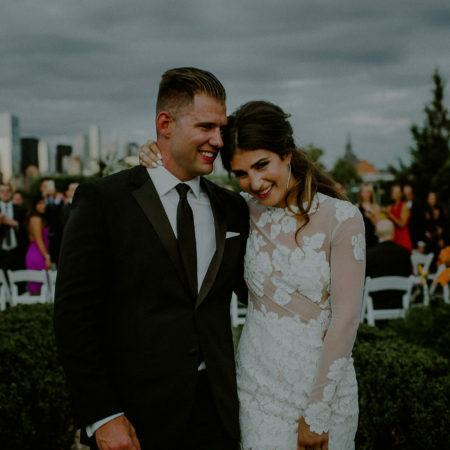 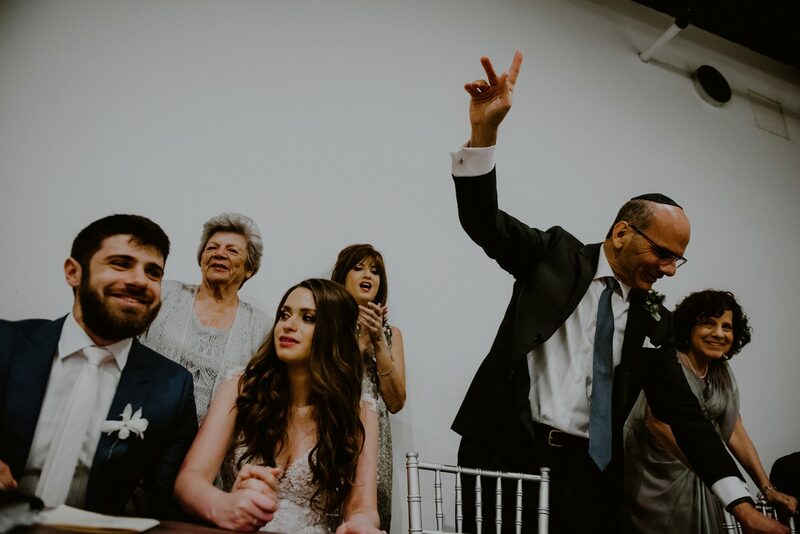 We talked about their close-knit families (in between their mini dance sets, of course), a desire to incorporate their strong ties to the Jewish heritage, how they wanted their wedding to flow naturally, and not have any traditions forced or feel staged. 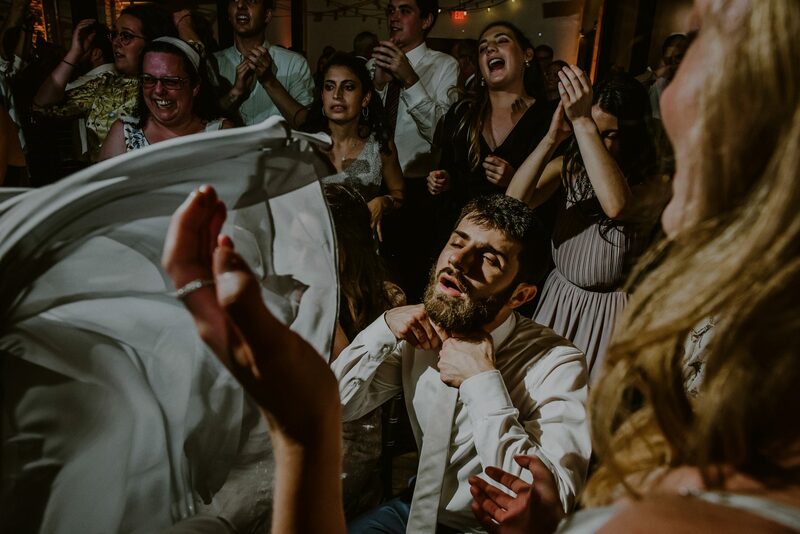 This might mean doing things a little outside of the box of a traditional Orthodox Jewish wedding. 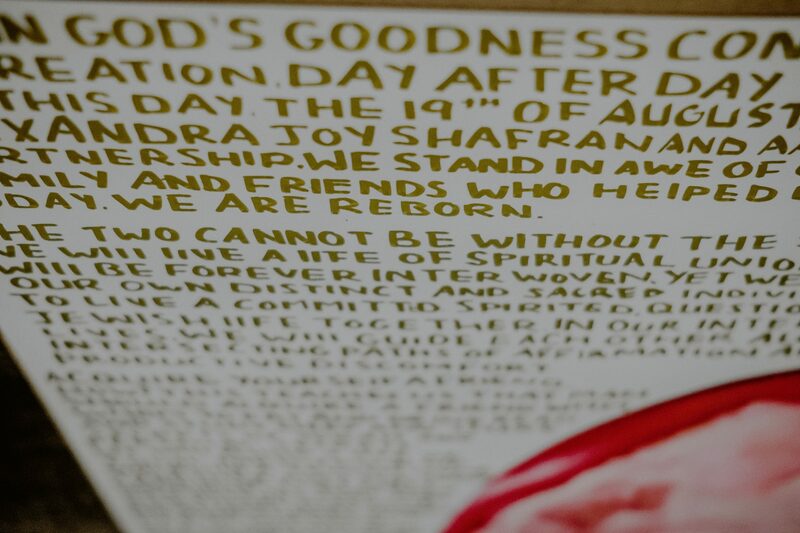 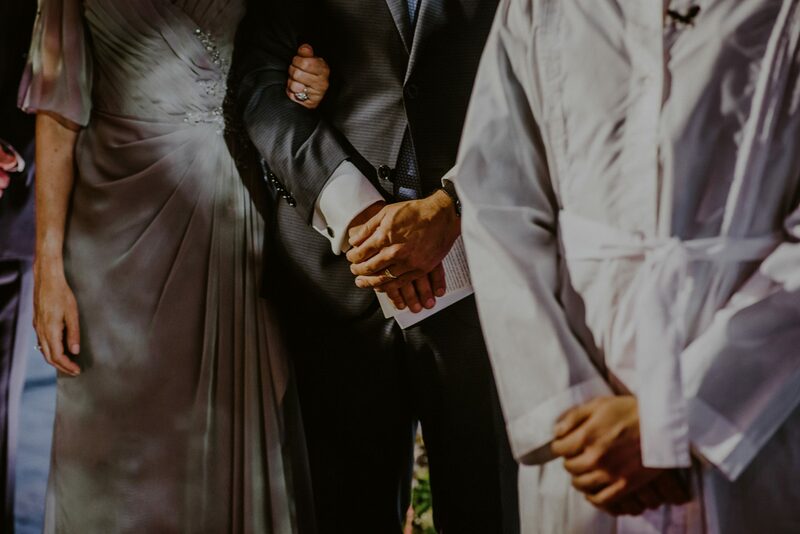 For one, men and women were mixed, but the intentional celebration of their deep-rooted traditions, and love for their culture and families is what they really wanted to represent. 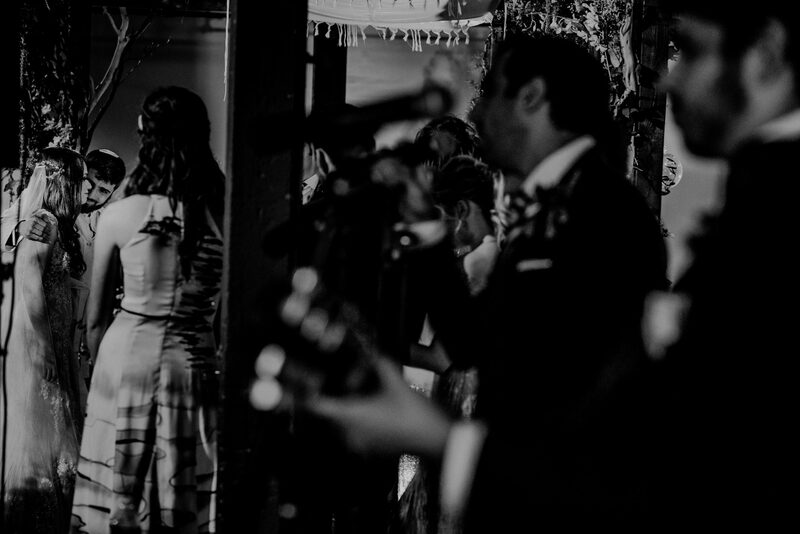 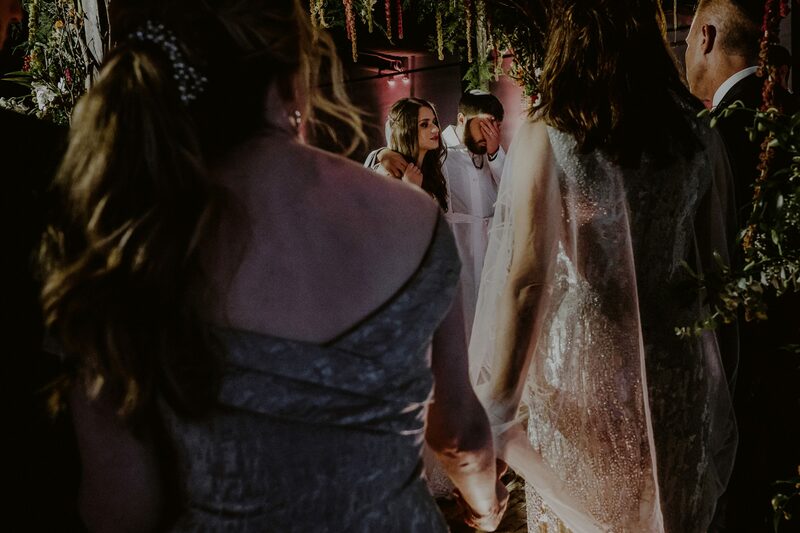 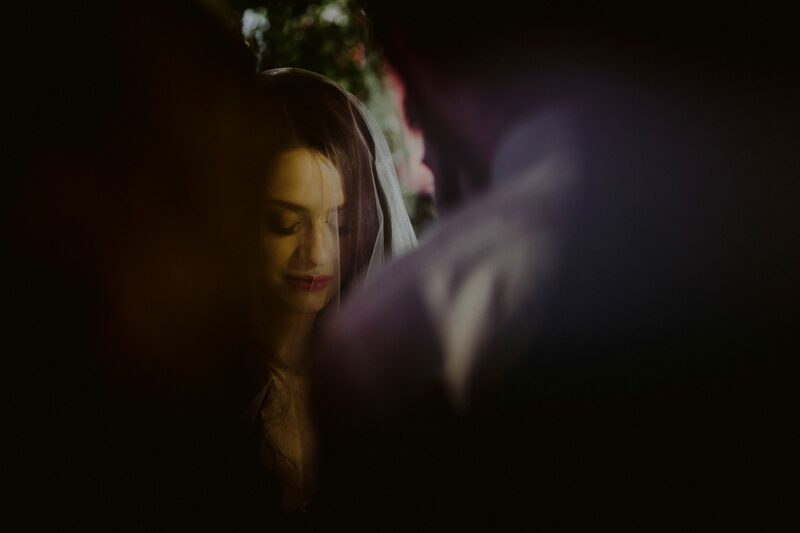 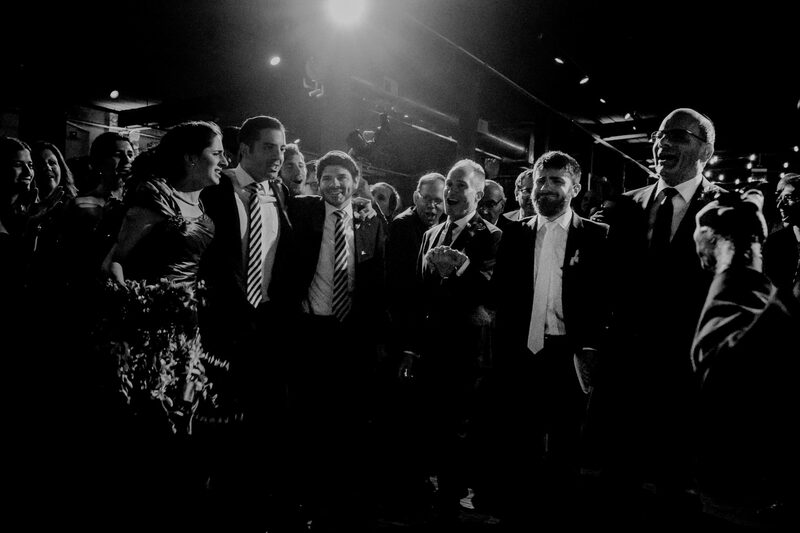 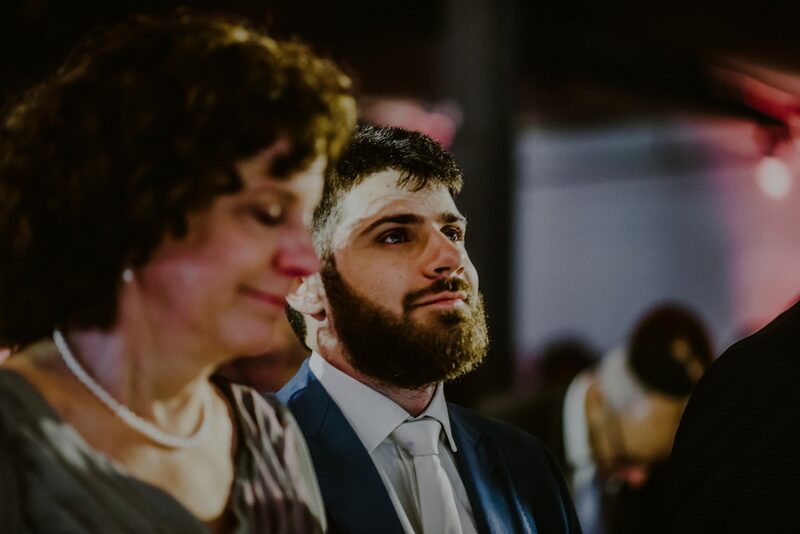 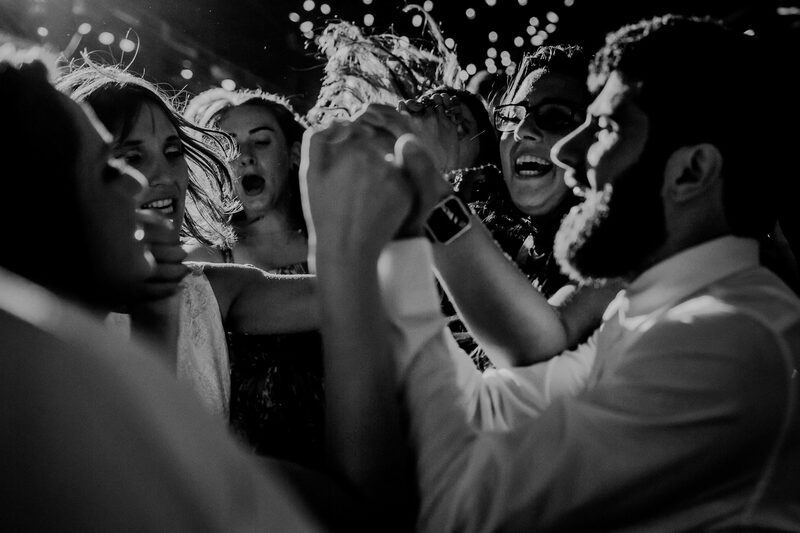 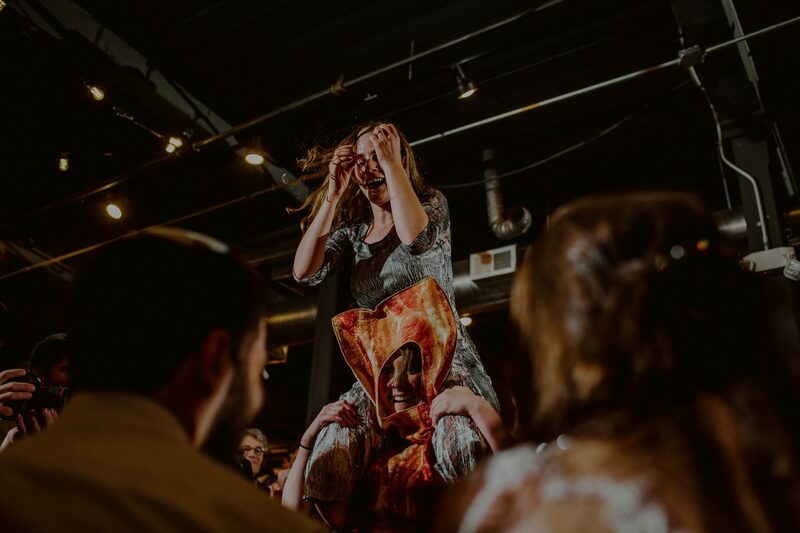 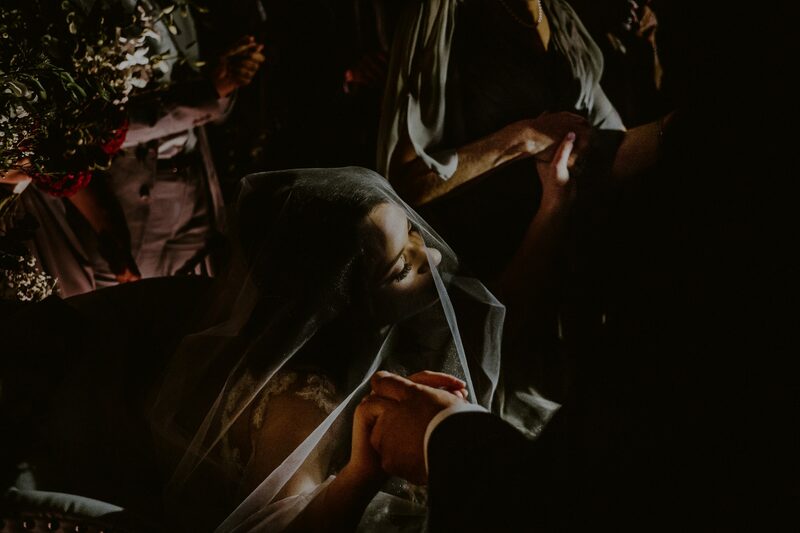 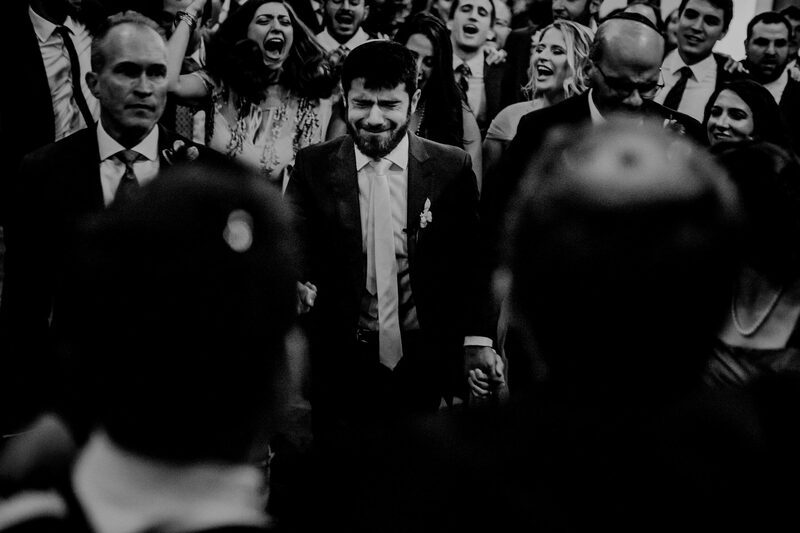 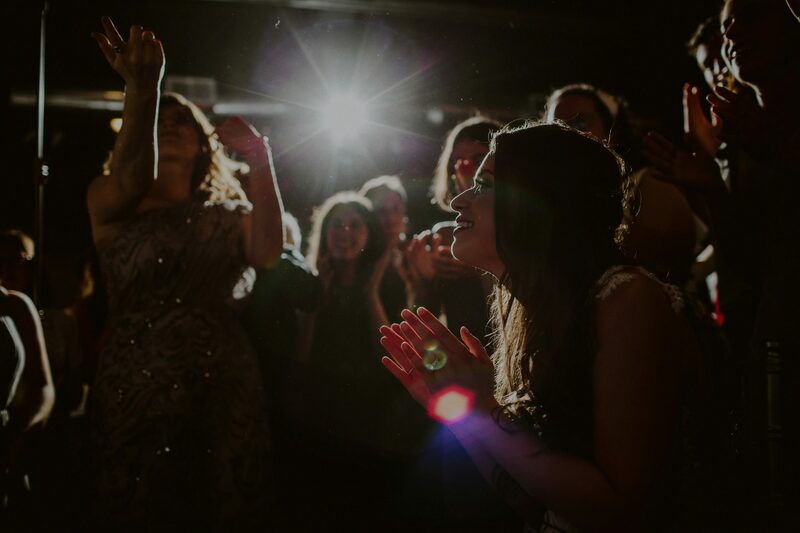 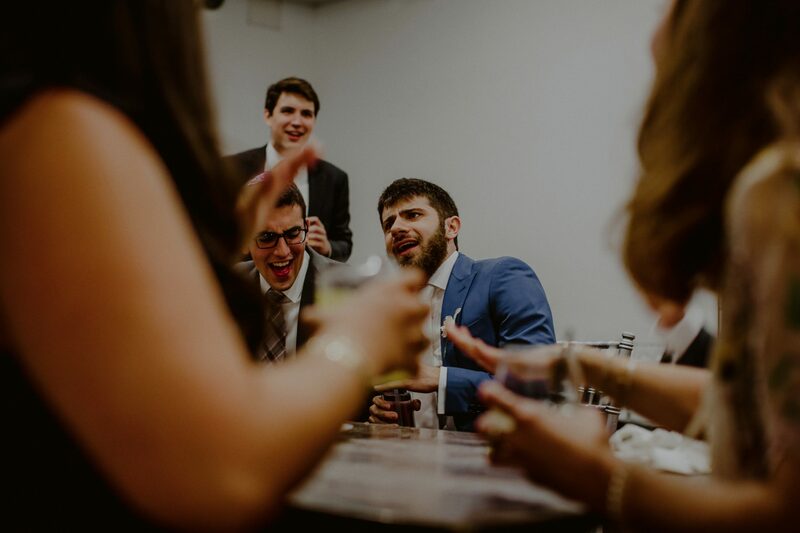 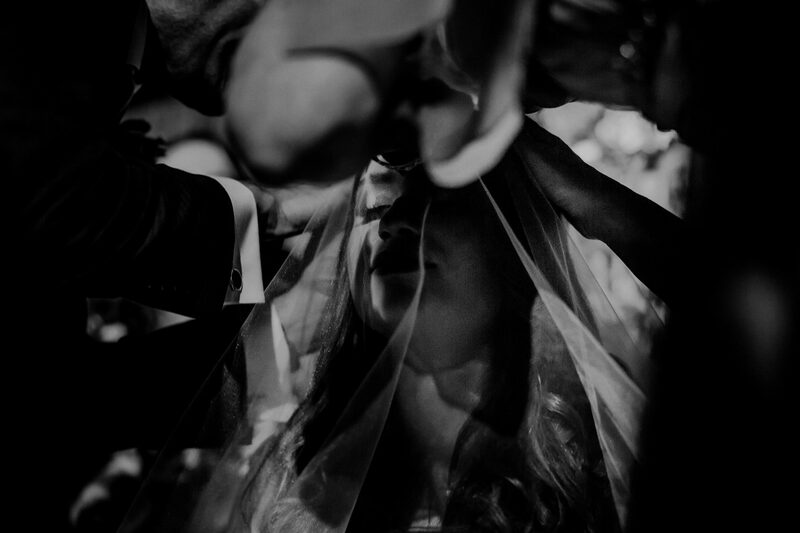 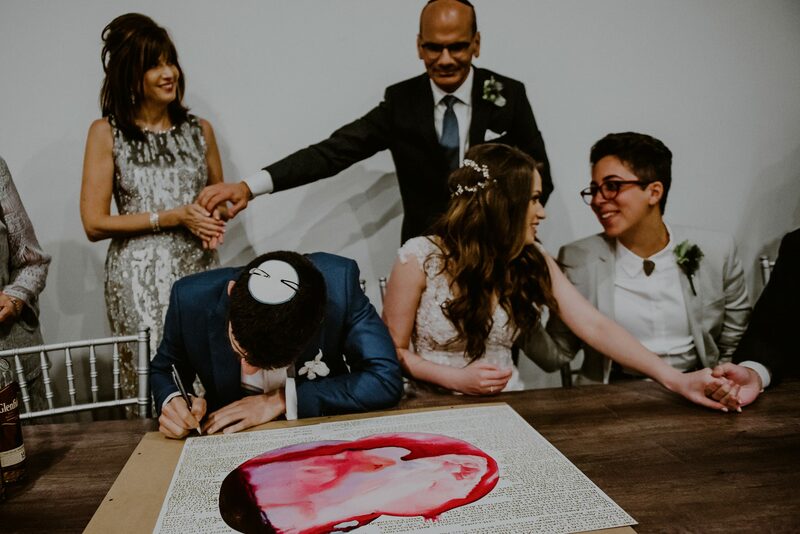 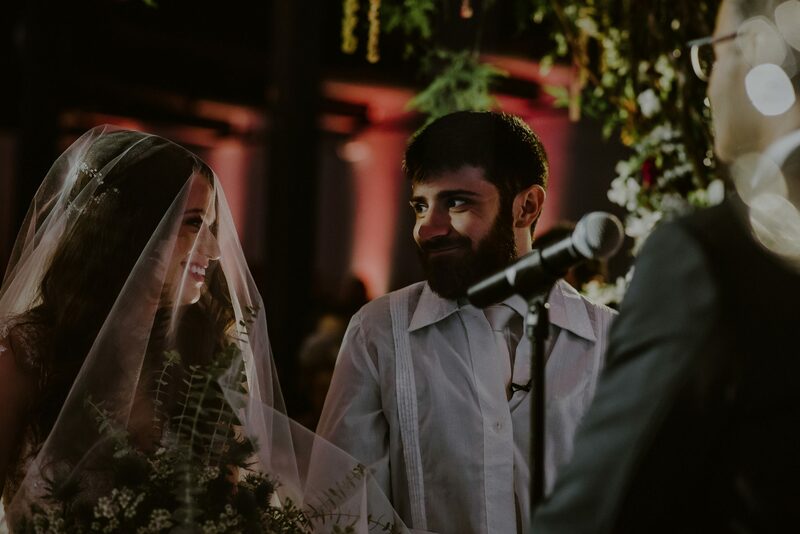 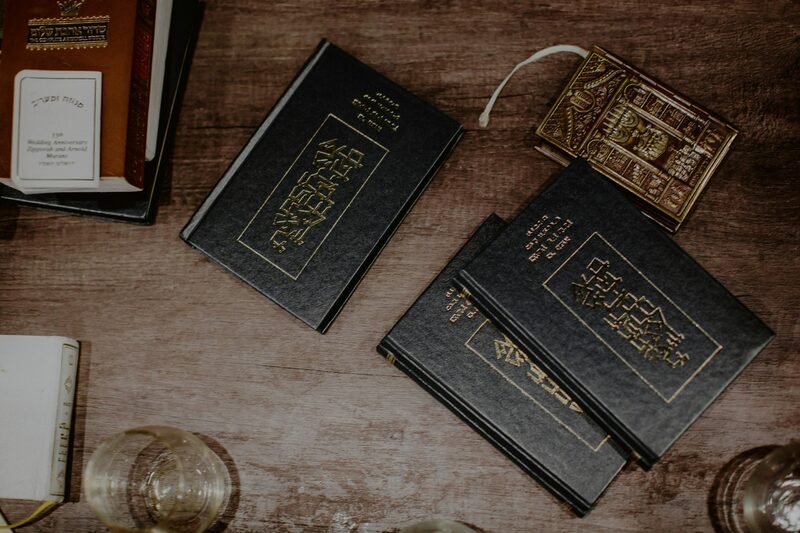 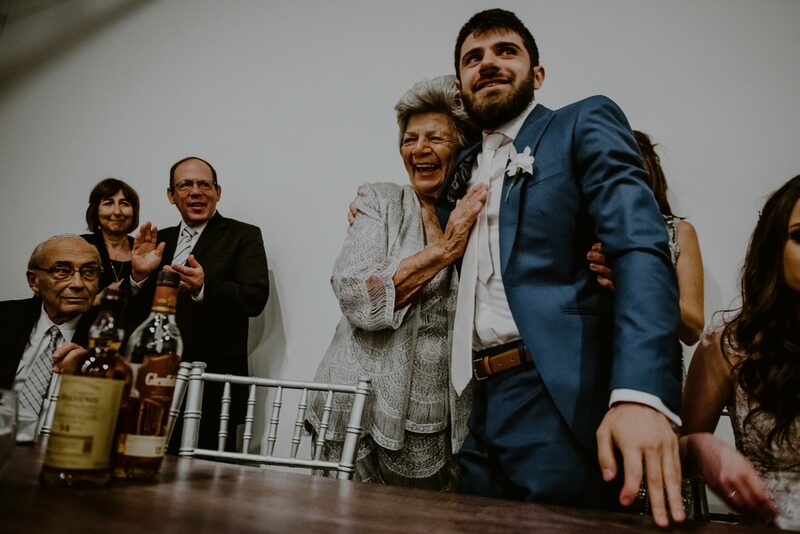 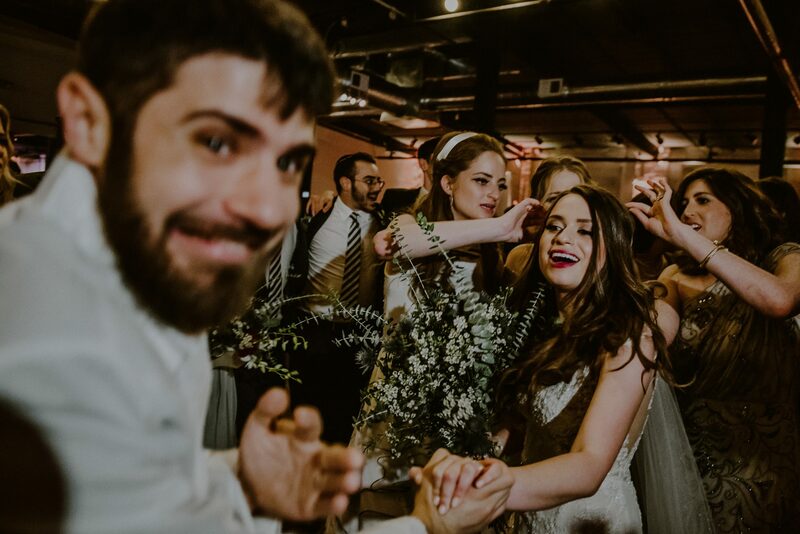 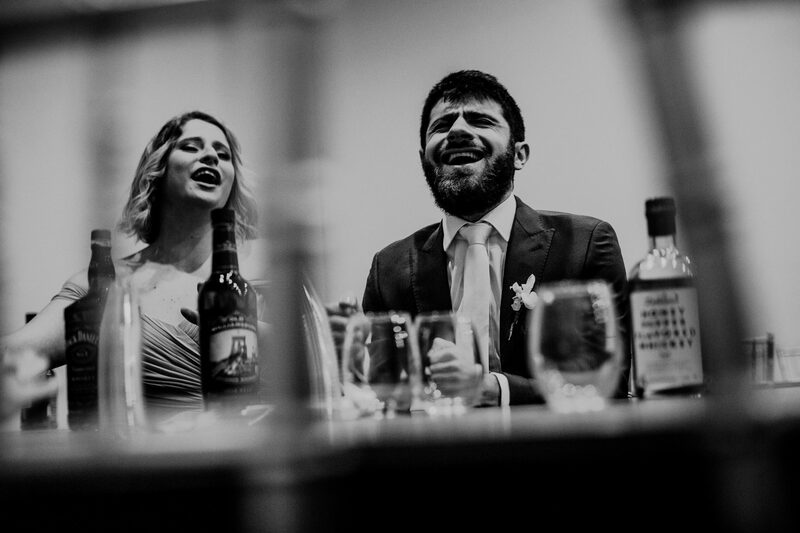 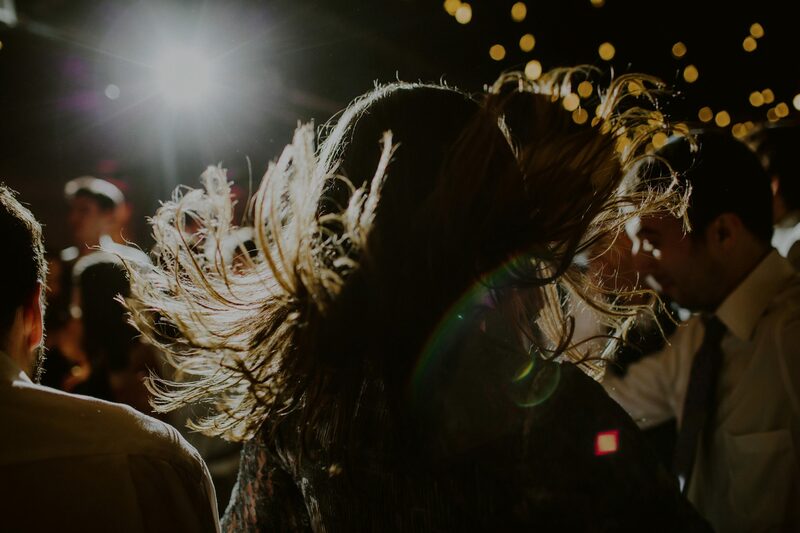 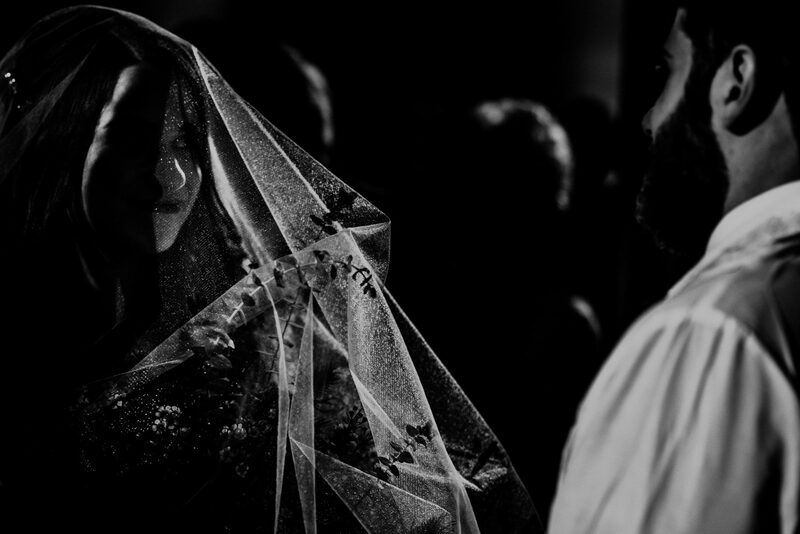 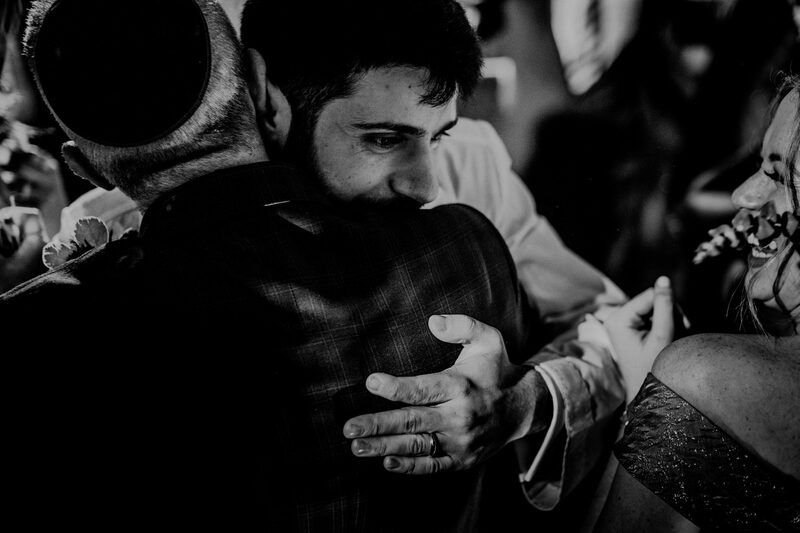 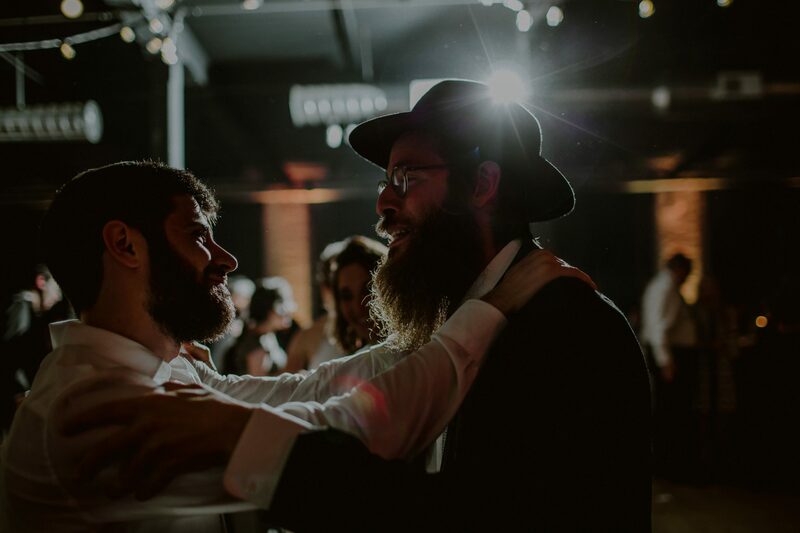 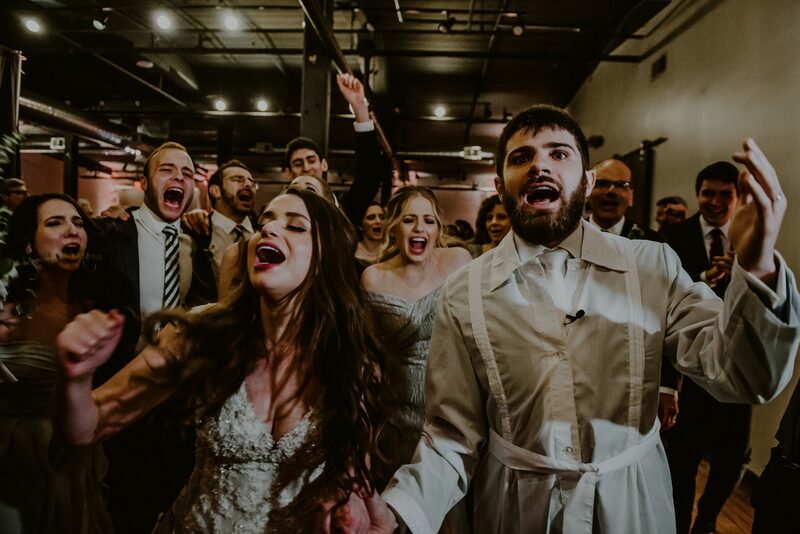 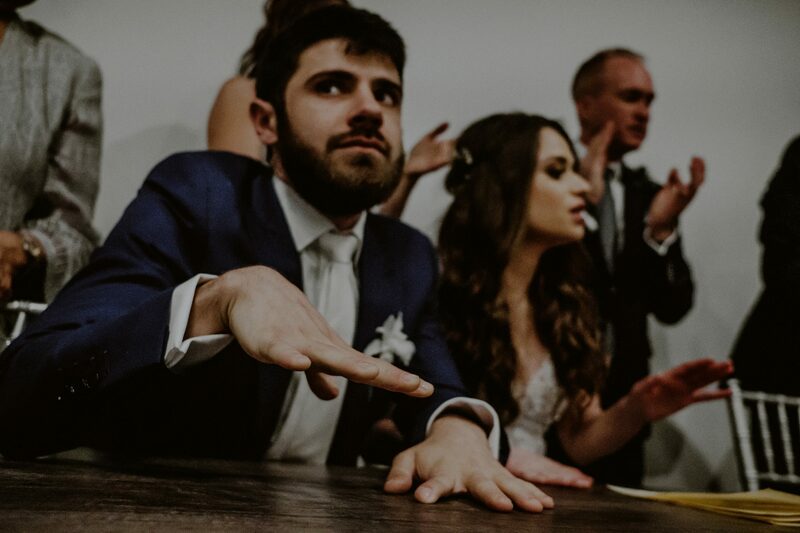 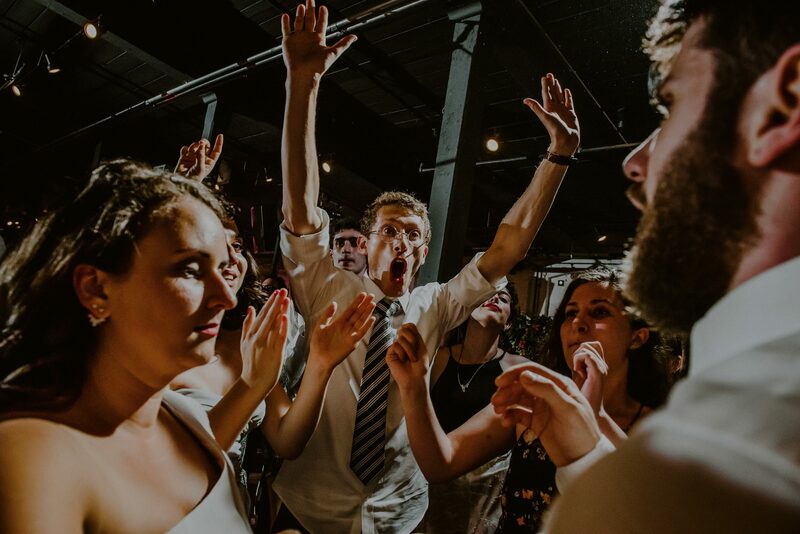 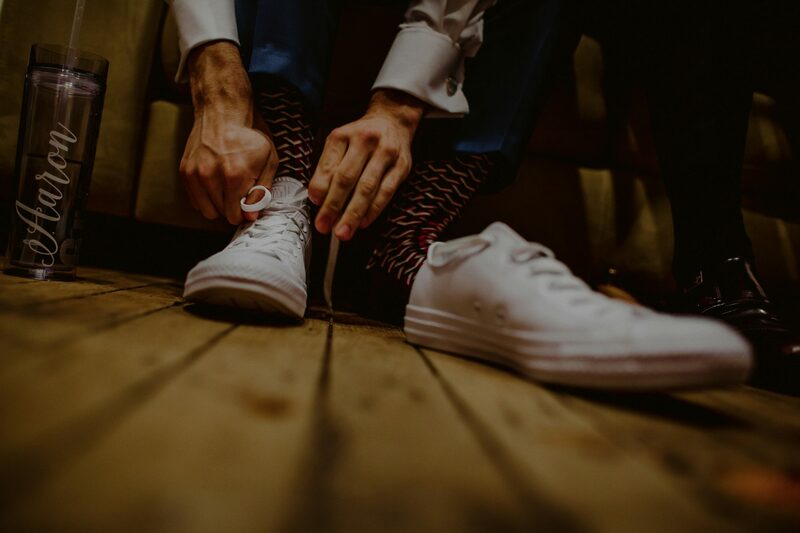 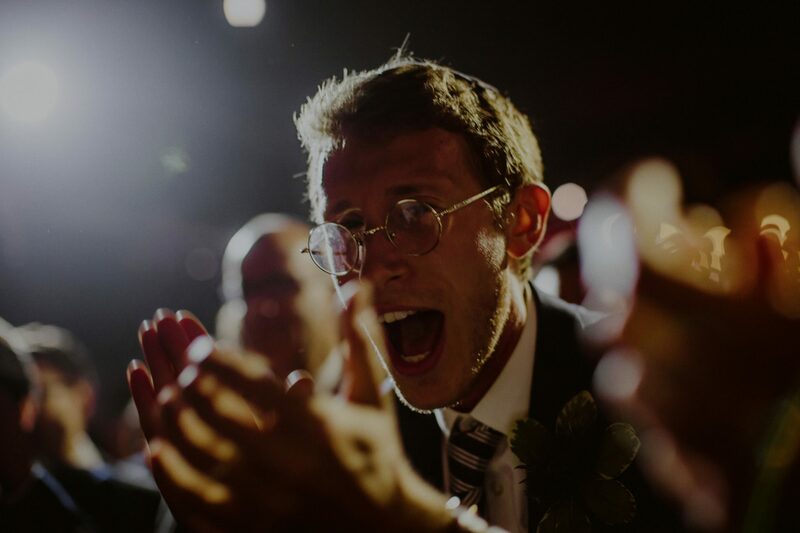 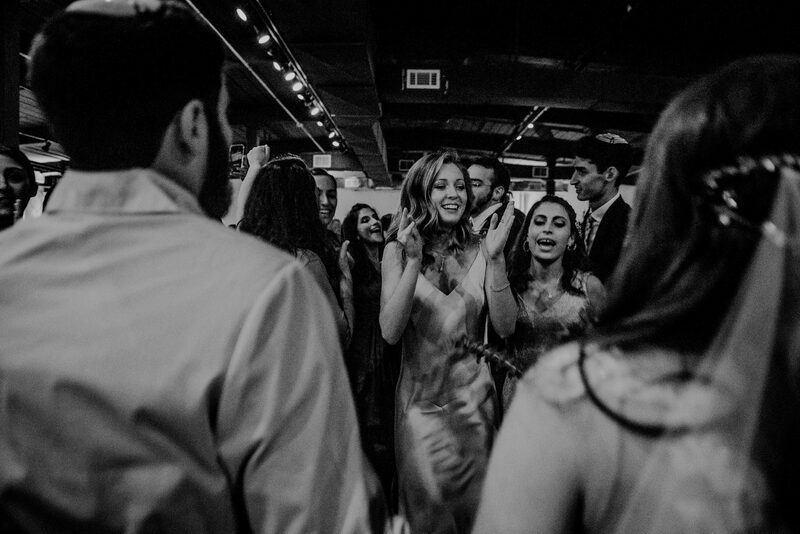 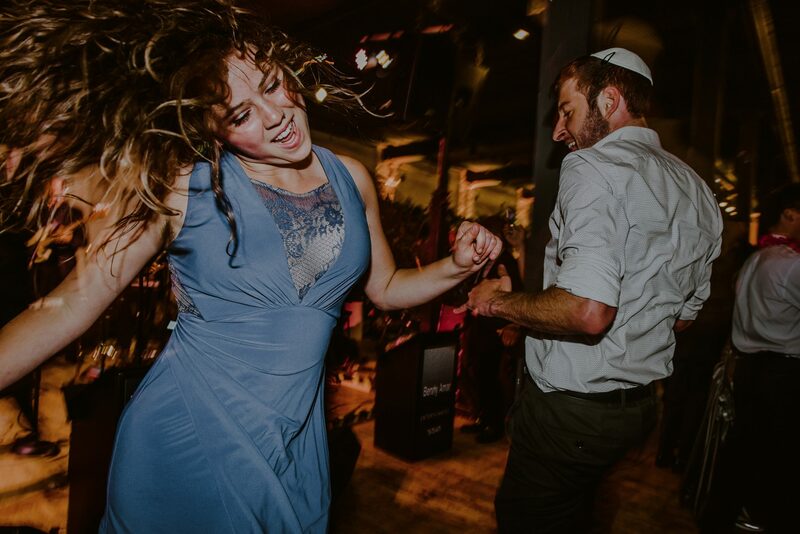 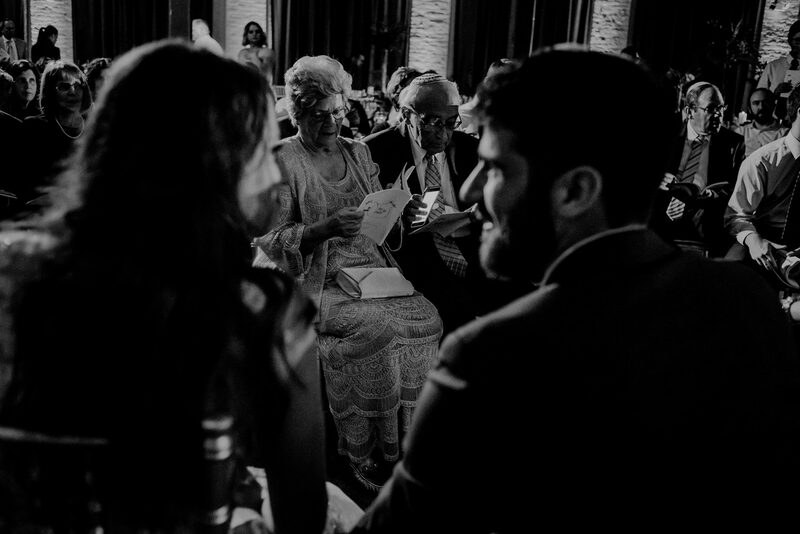 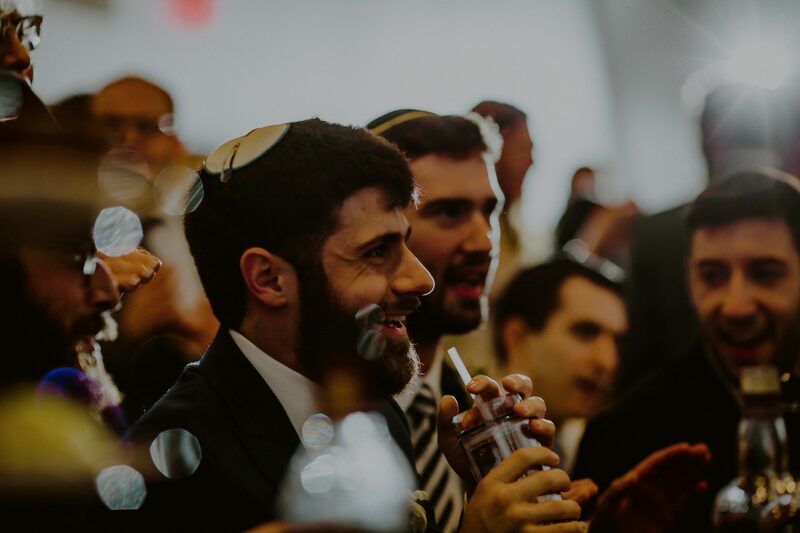 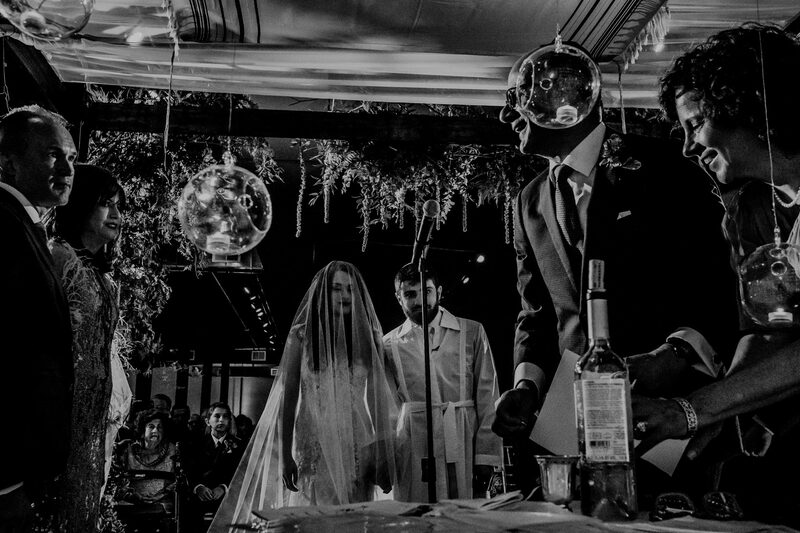 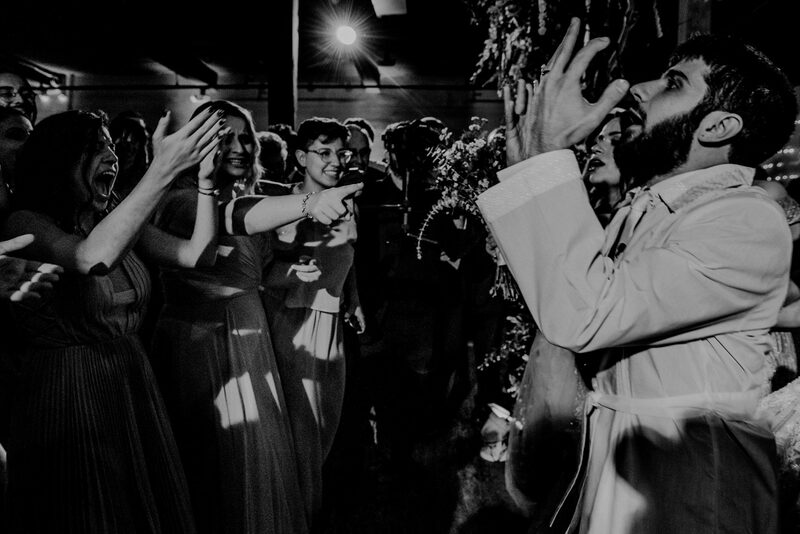 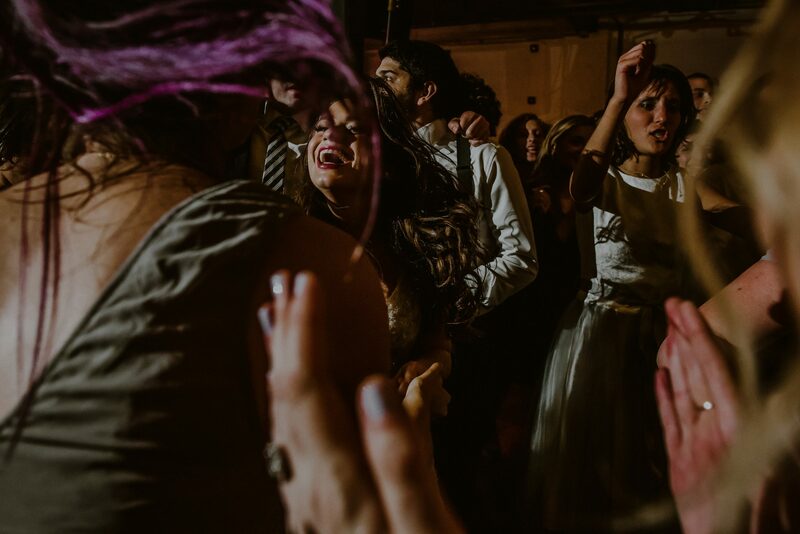 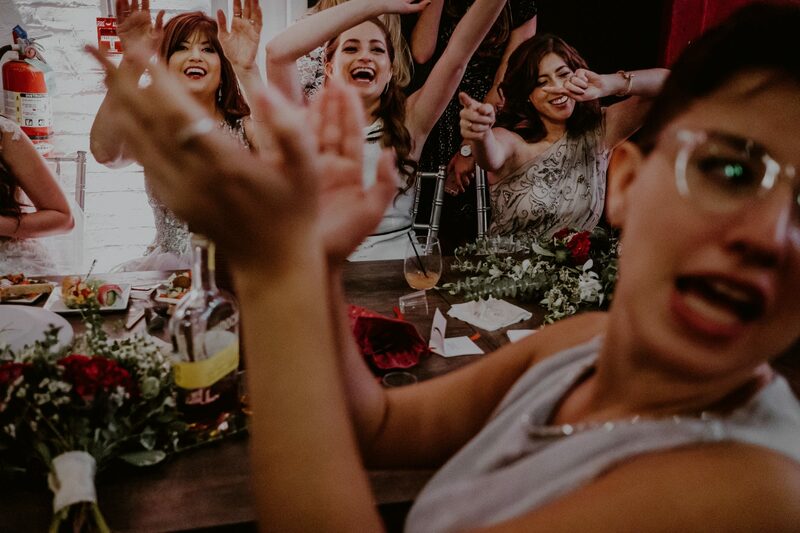 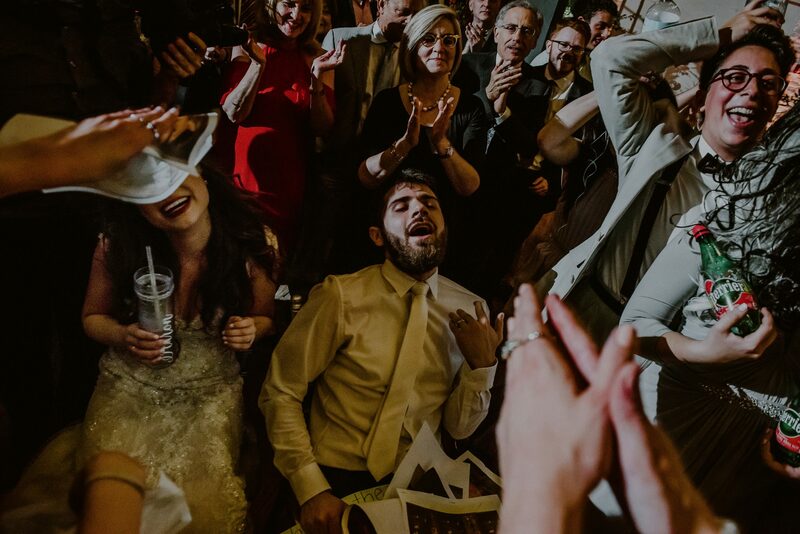 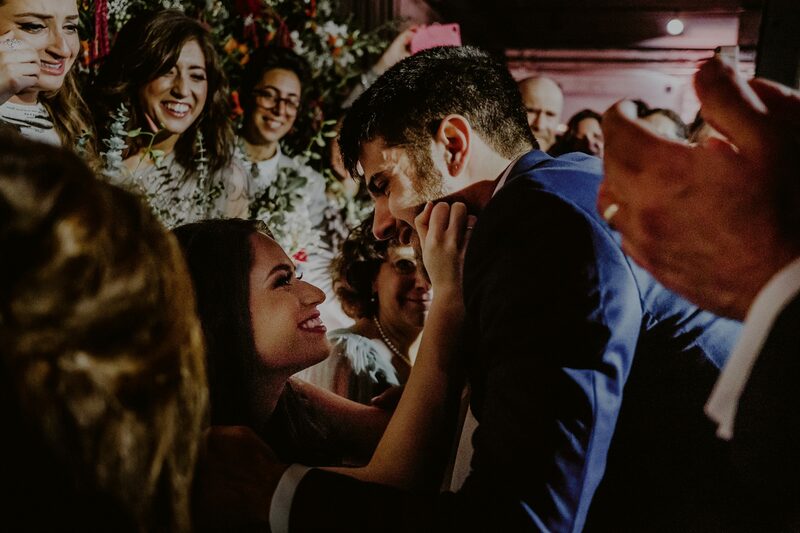 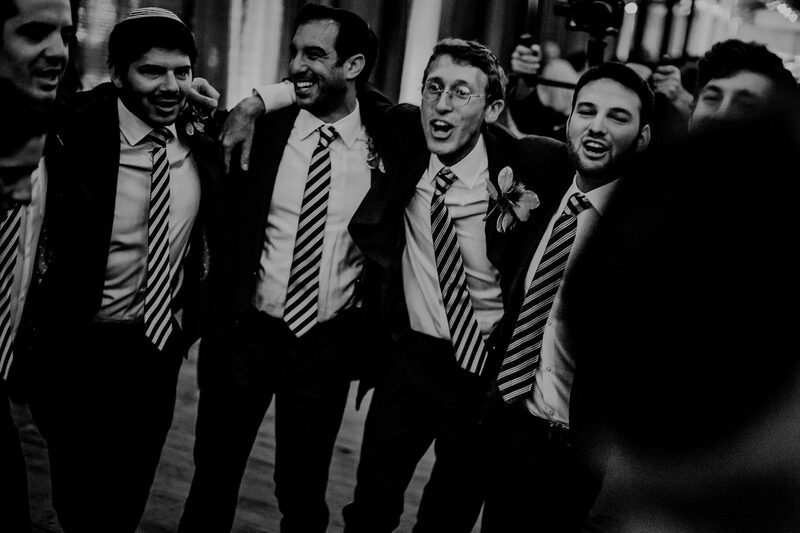 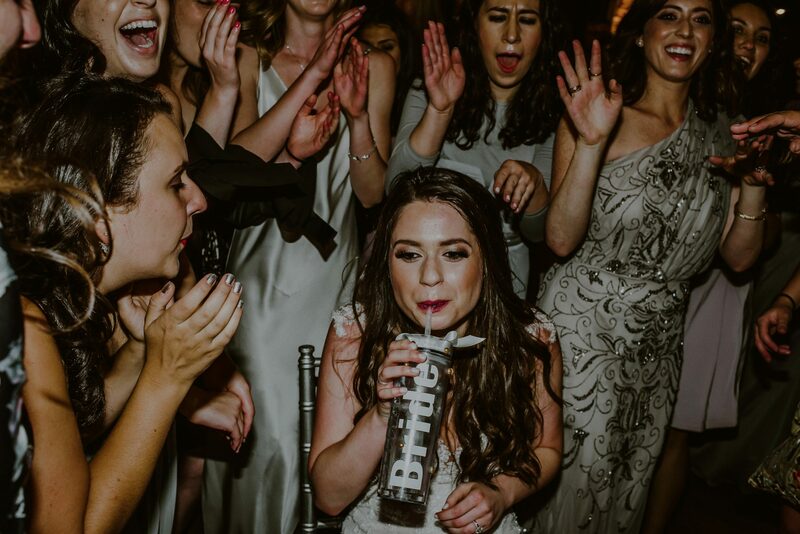 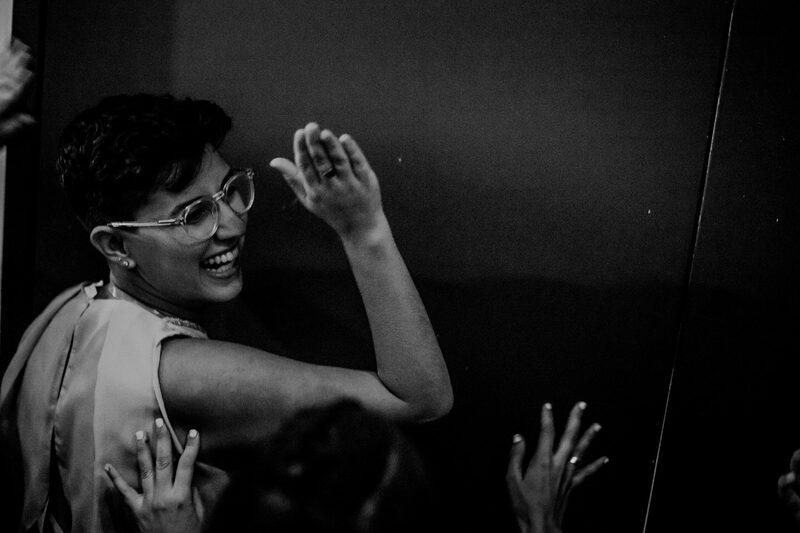 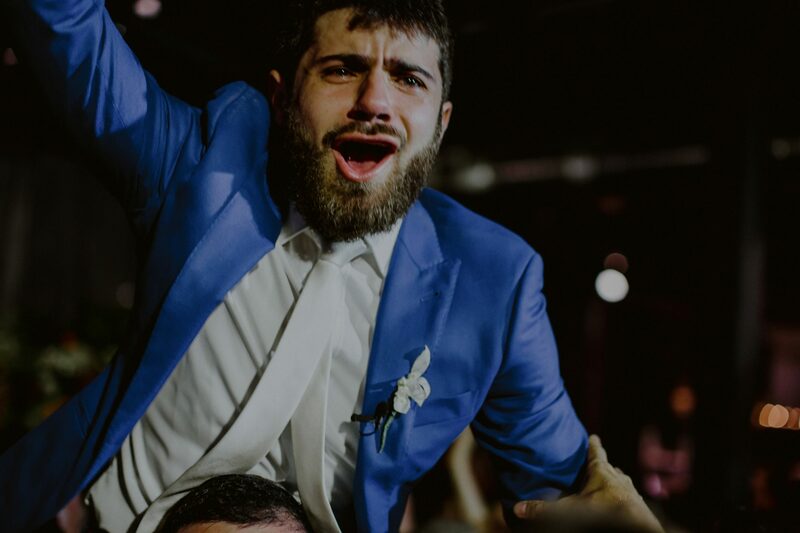 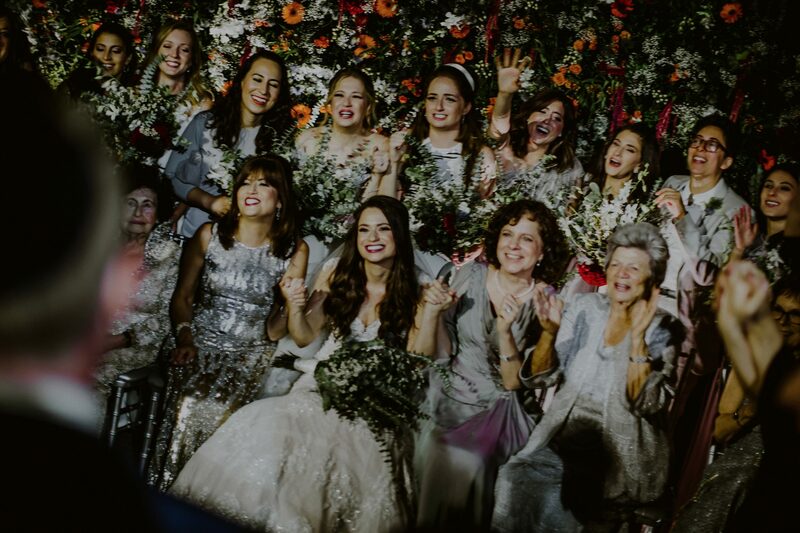 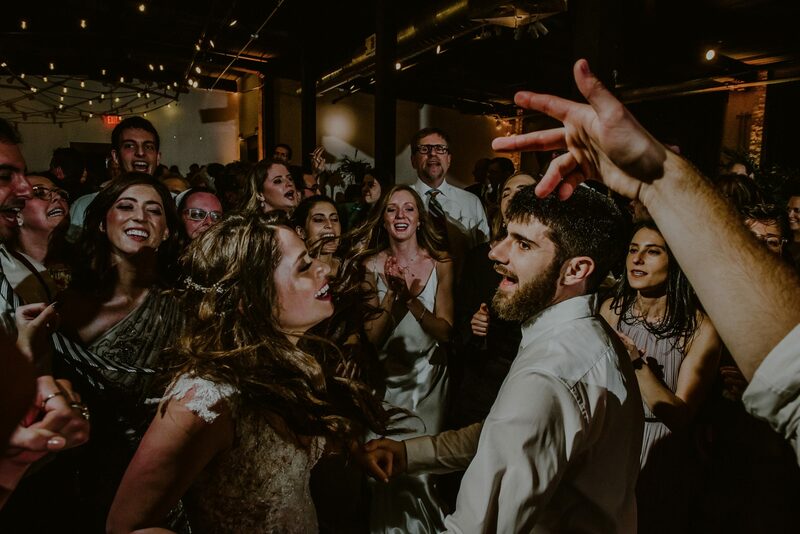 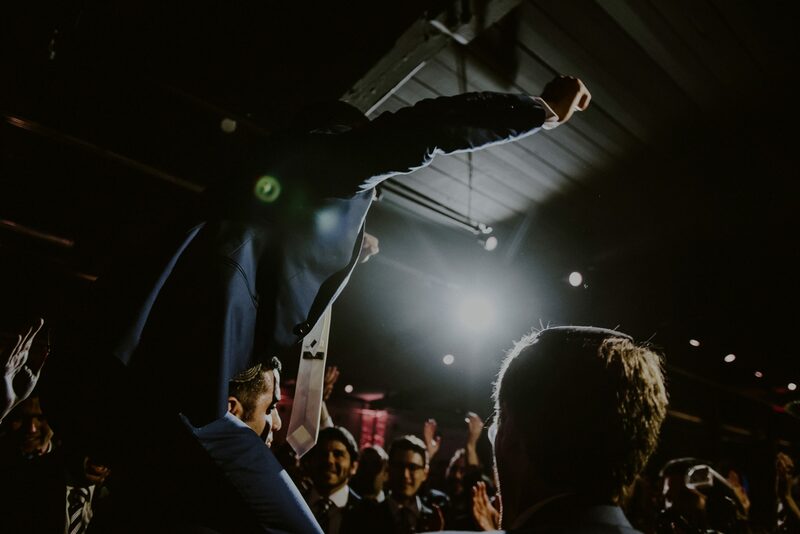 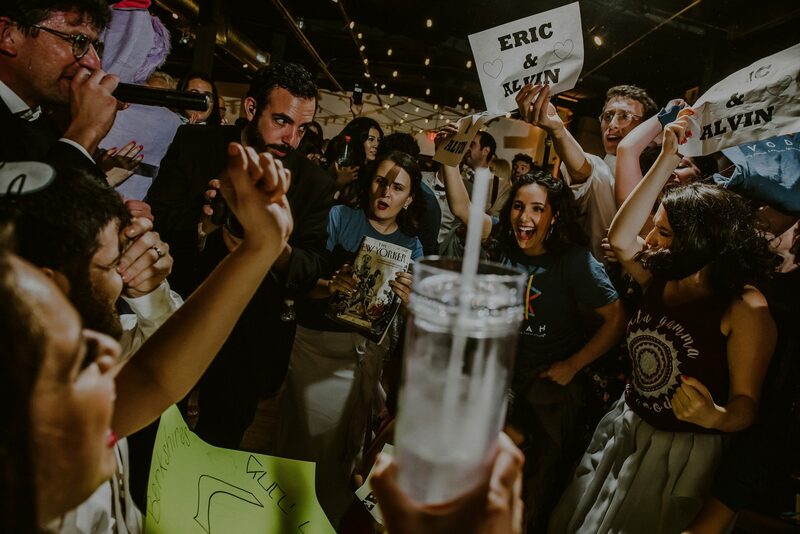 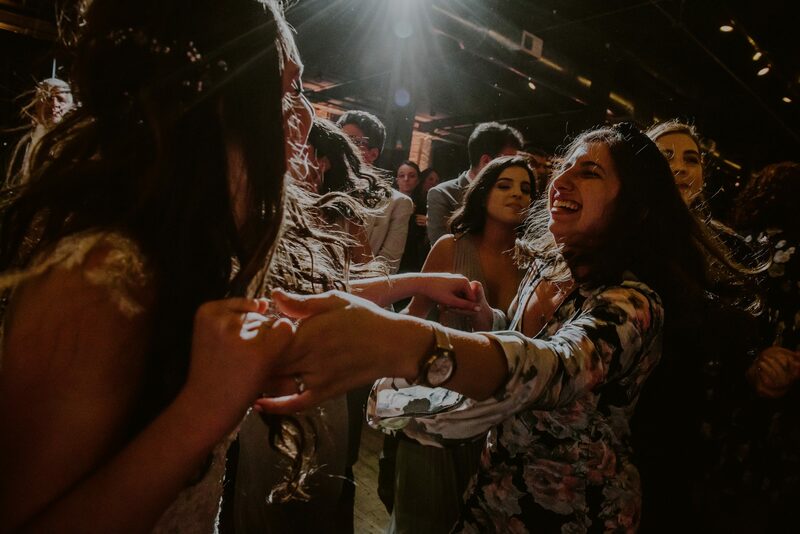 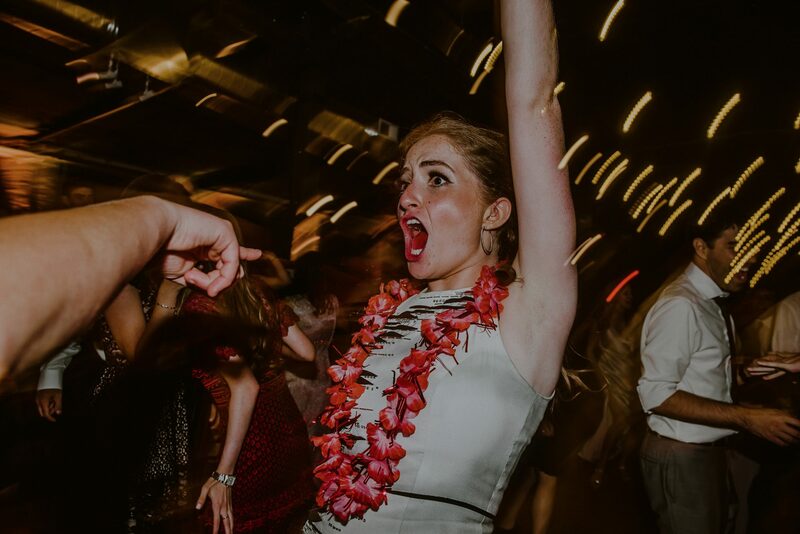 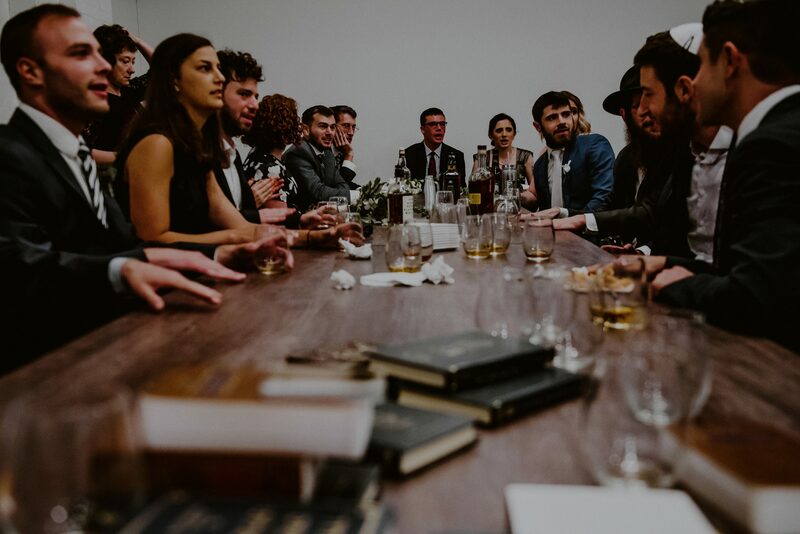 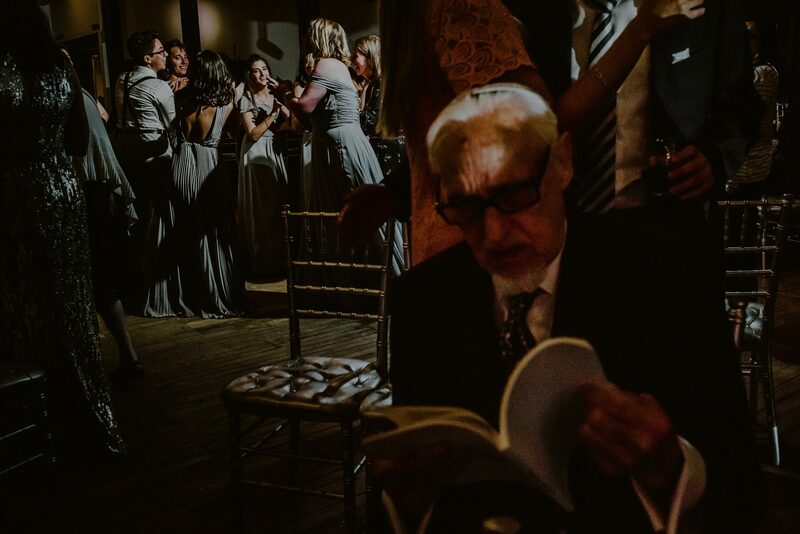 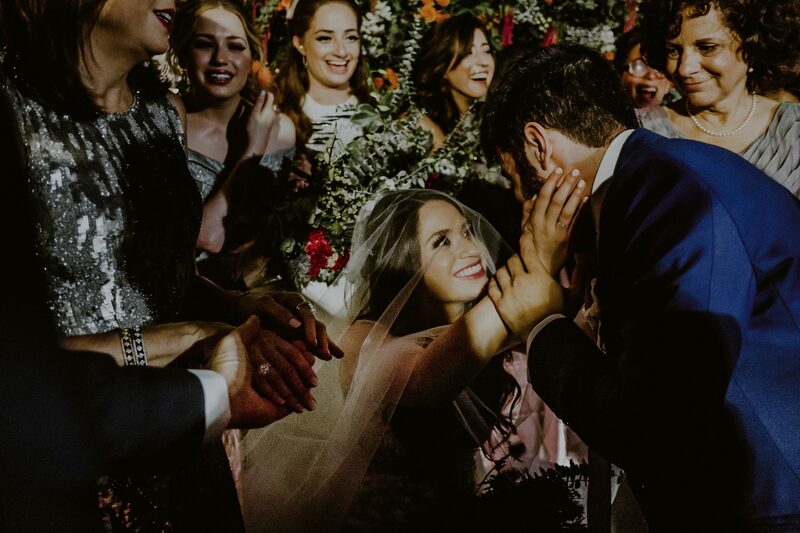 All of the traditional aspects of an Orthodox wedding were present – the energetic Ketubah signing and Bride+Groom’s Tisch, followed by the emotional Badeken and chuppah ceremonies, and then a packed dance floor with a round of horah dancing that would put the center of a punk rock mosh pit to shame. 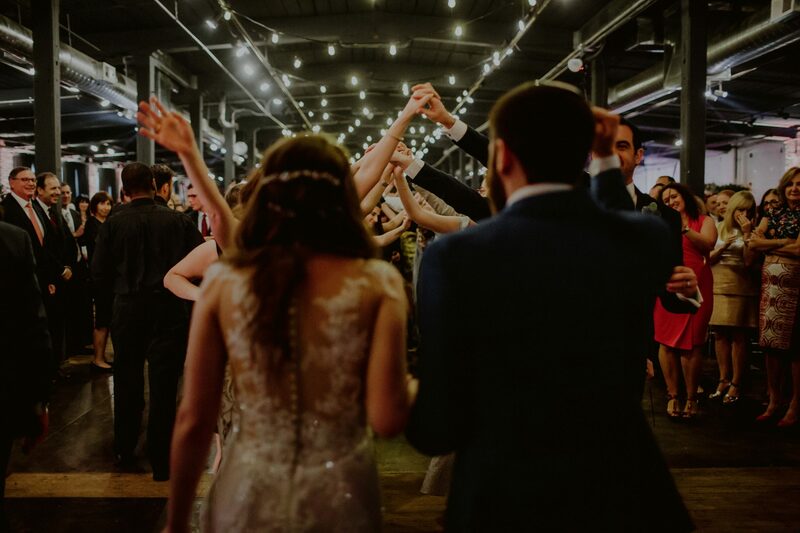 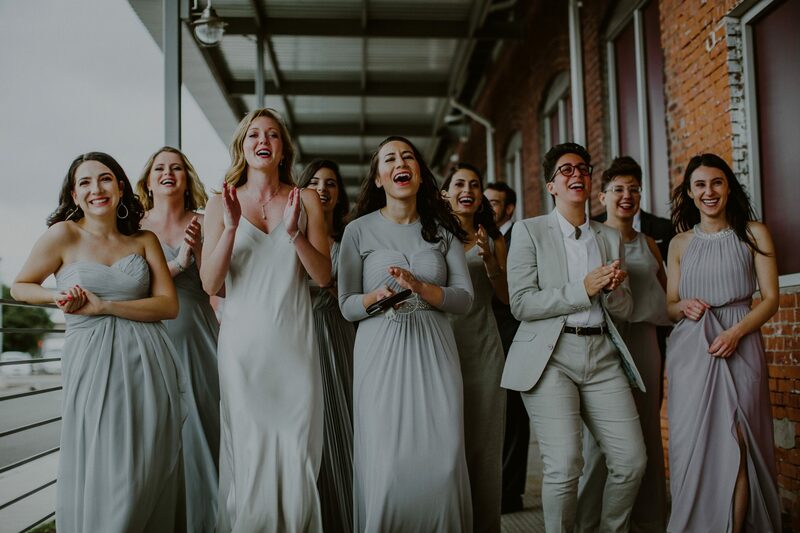 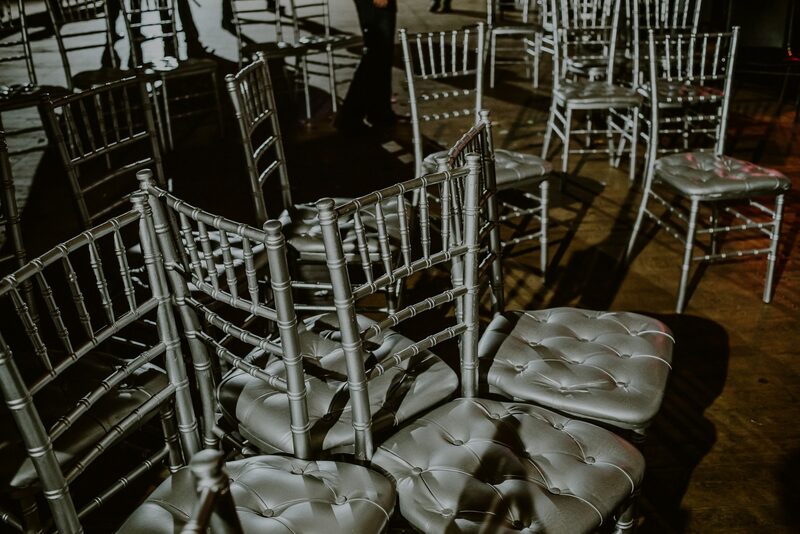 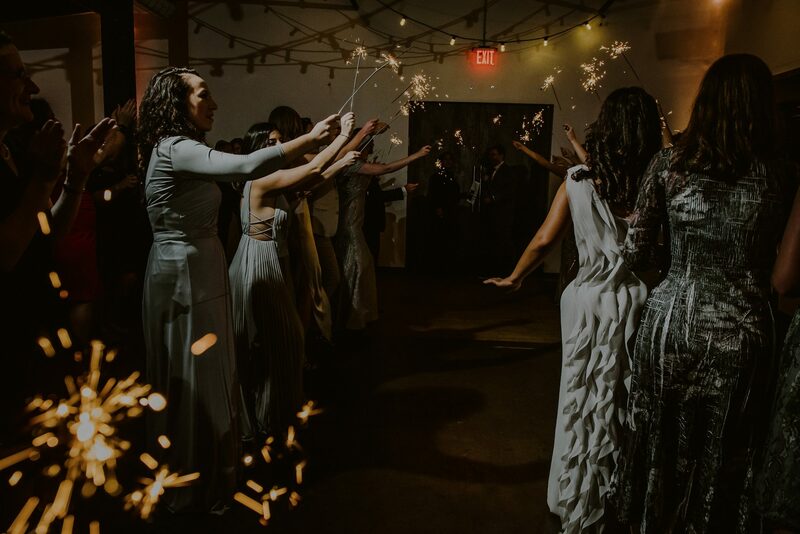 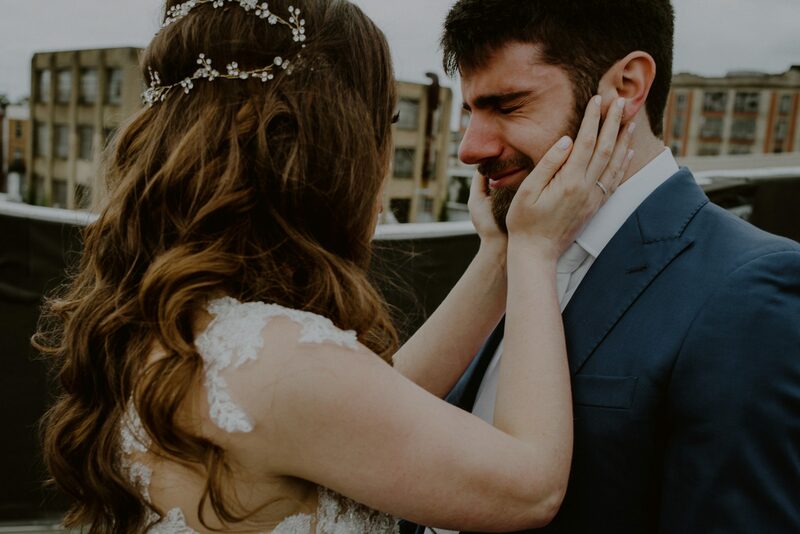 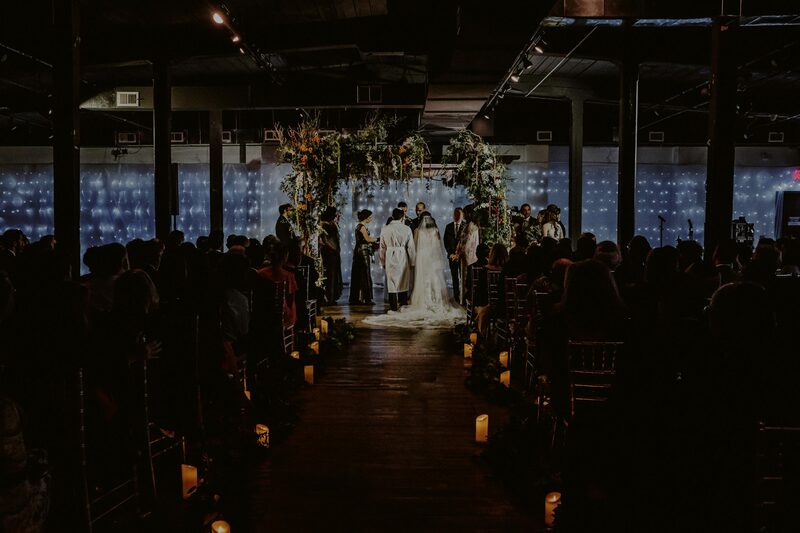 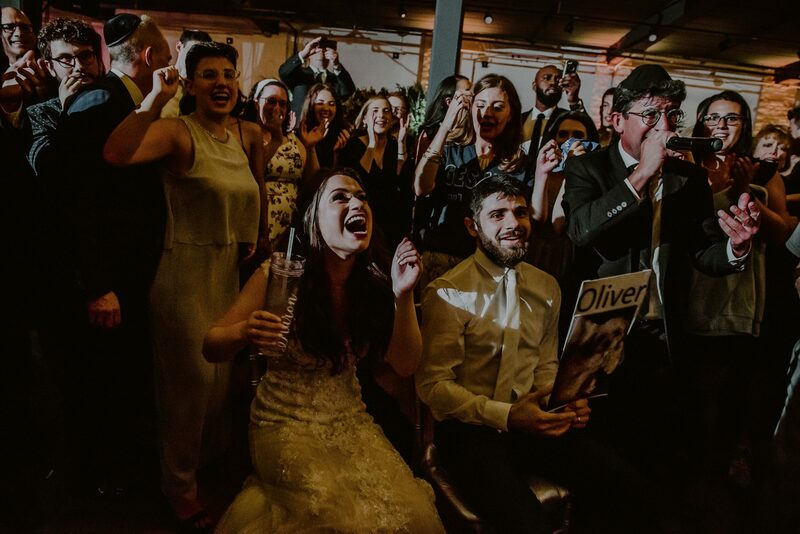 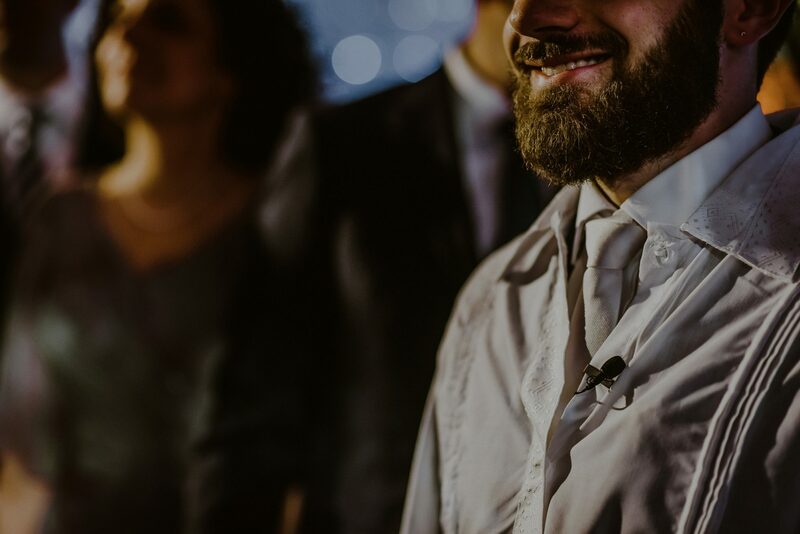 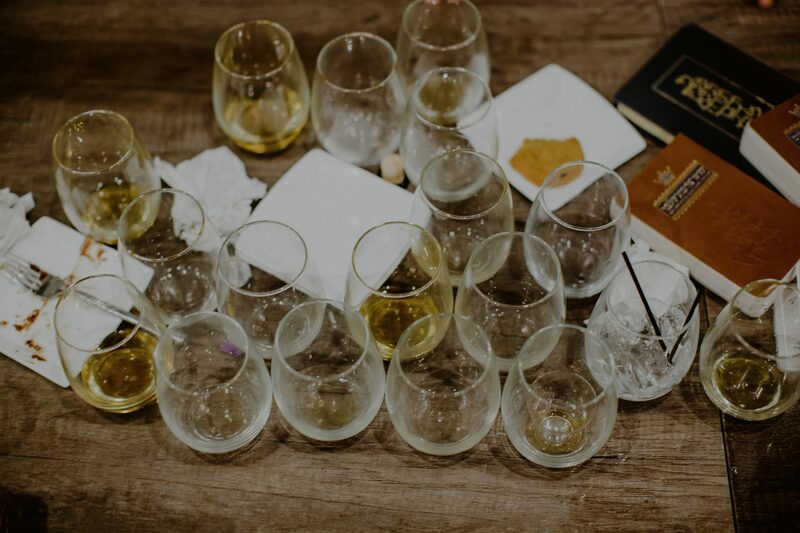 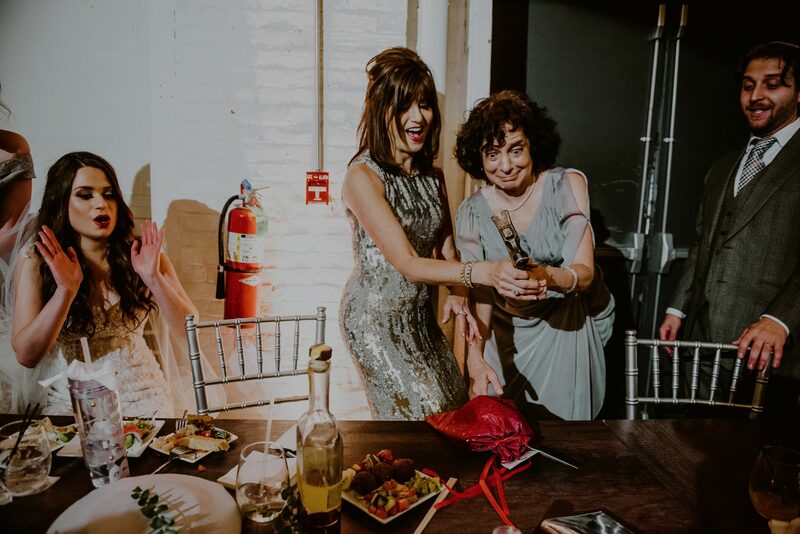 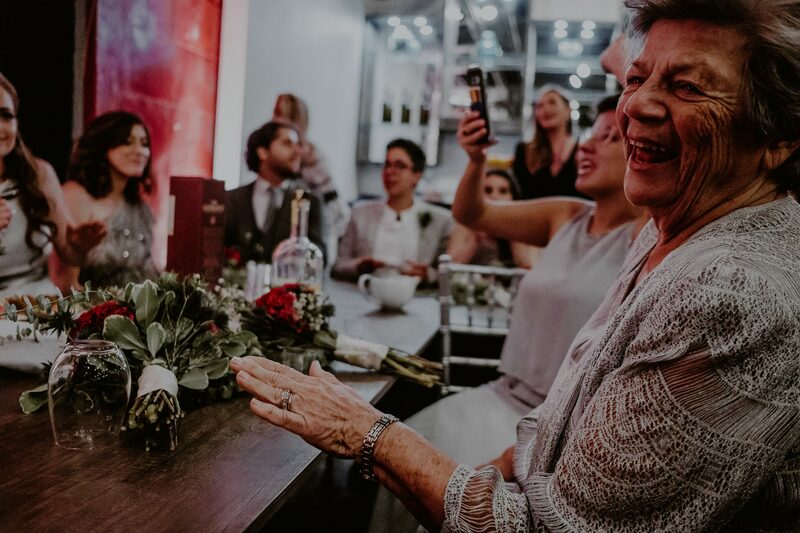 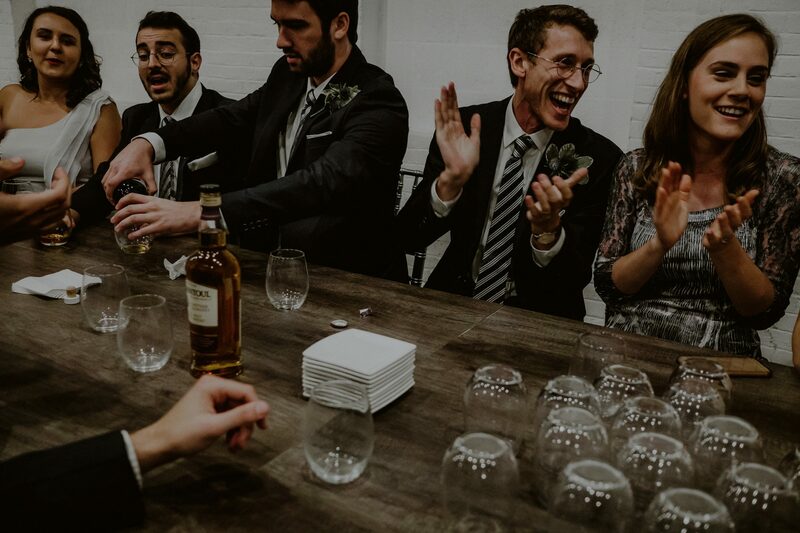 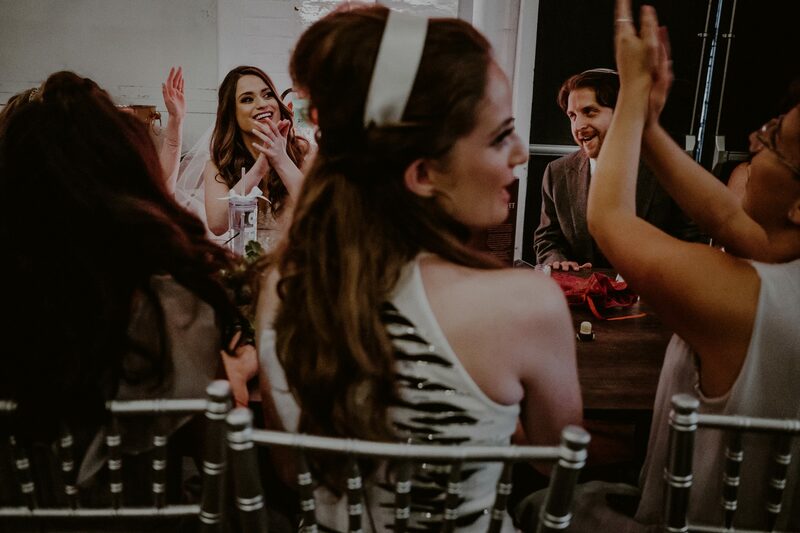 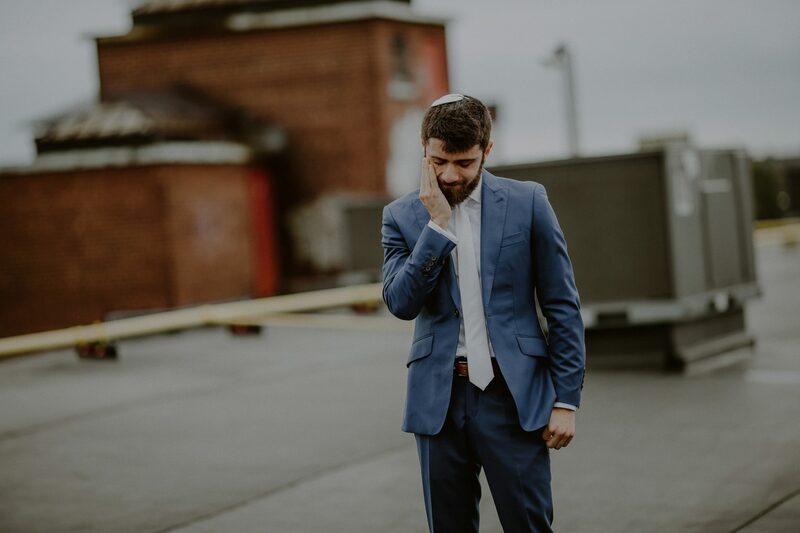 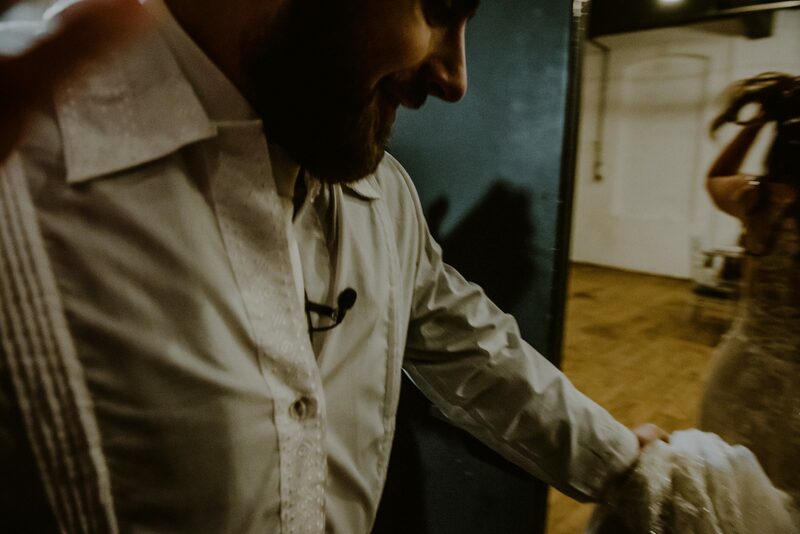 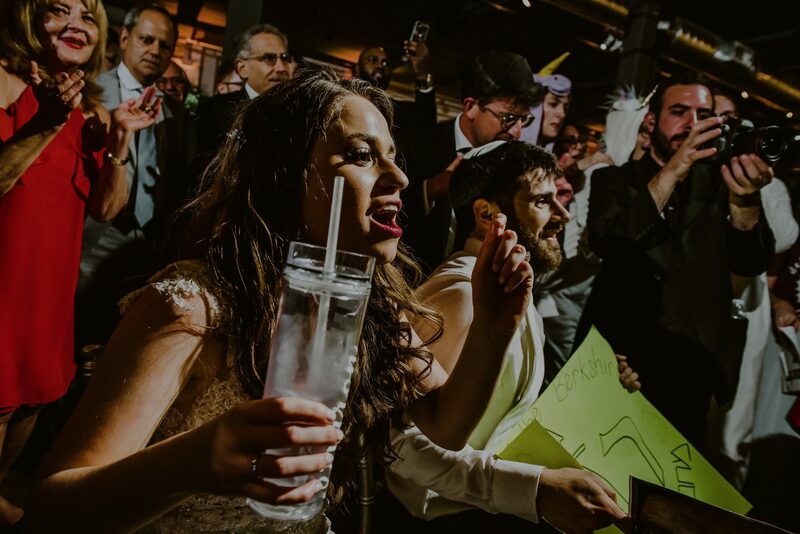 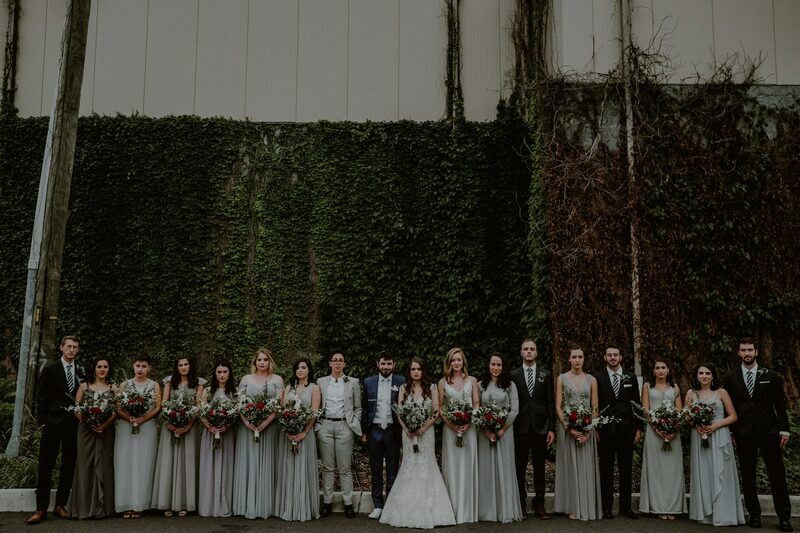 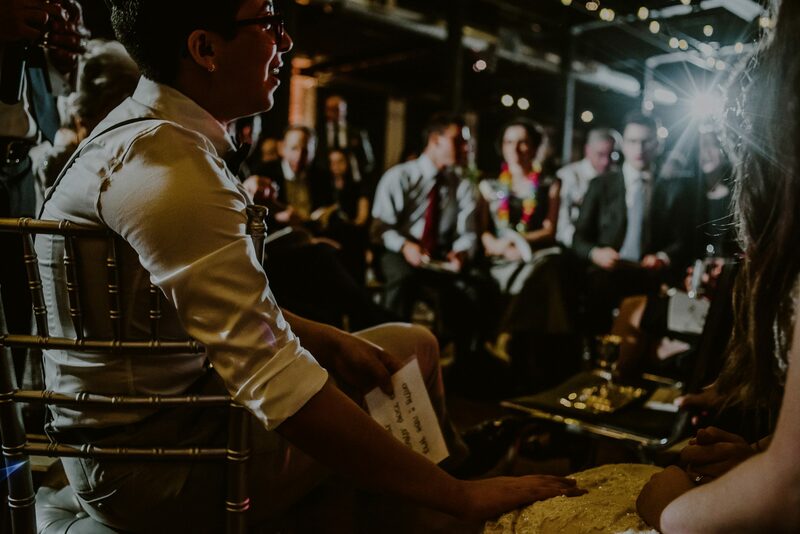 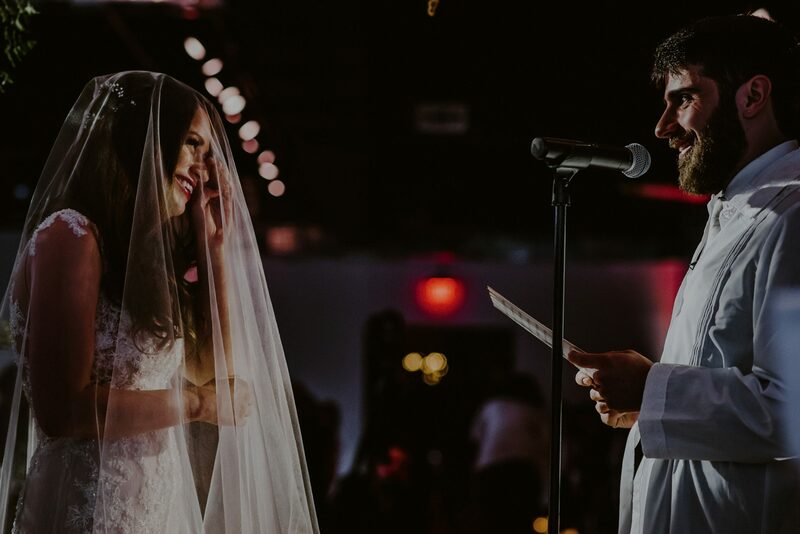 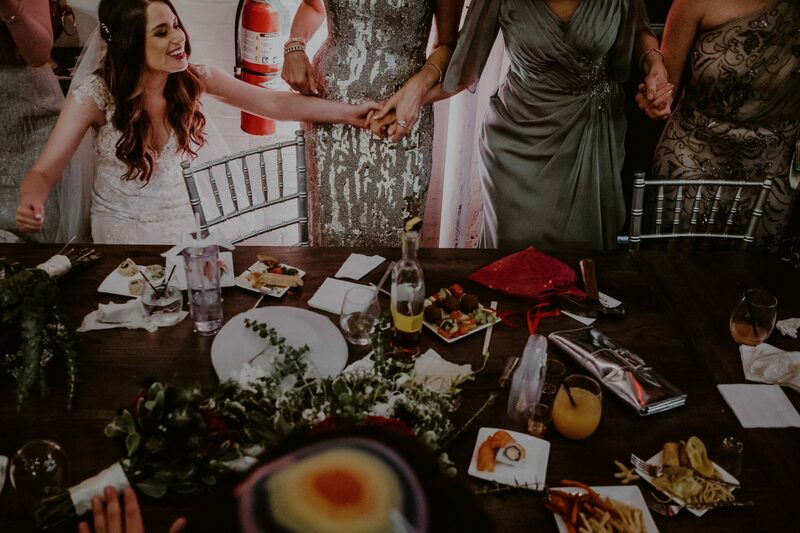 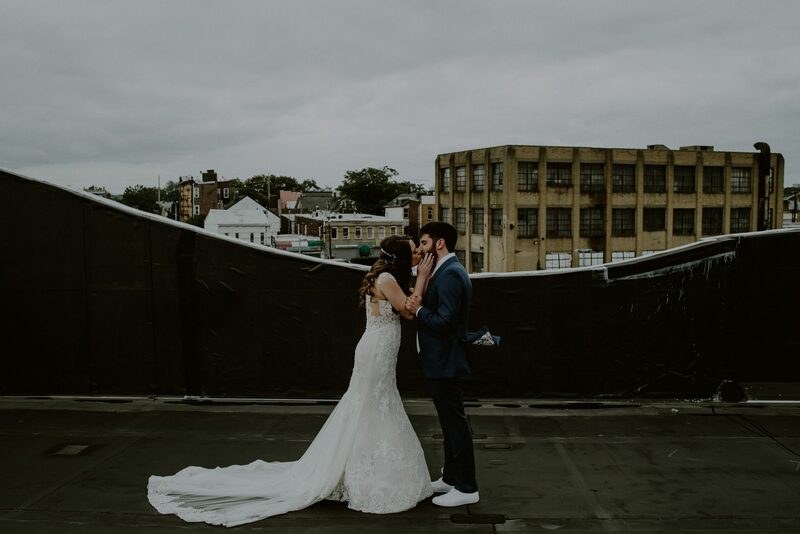 Their wedding at Factory 220 in Passaic, NJ was the perfect setting to host their 400 guests, with a modern, urban, and industrial vibe that tied them right back to their Brooklyn home, and kept things just a little bit “different”, exactly how they wanted. 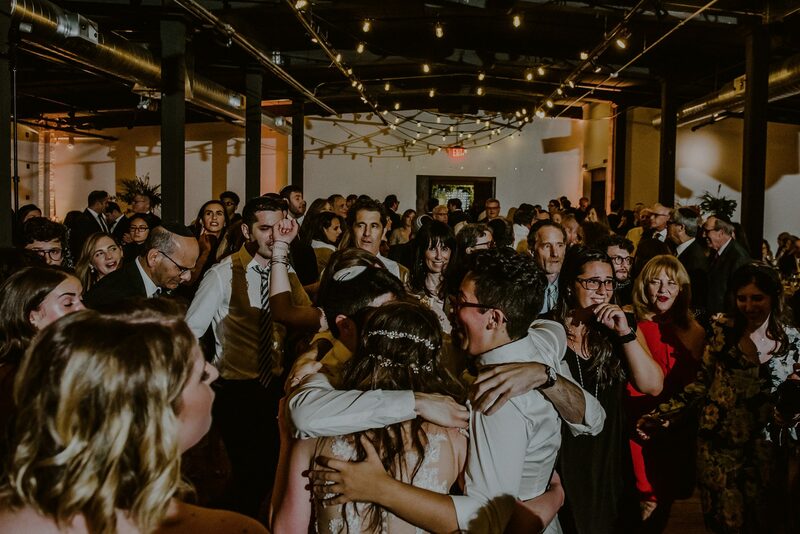 I absolutely loved being thrown right into the middle, front and center, in all of the important moments, pushing my way through as I felt the tornado of emotions rushing through me! 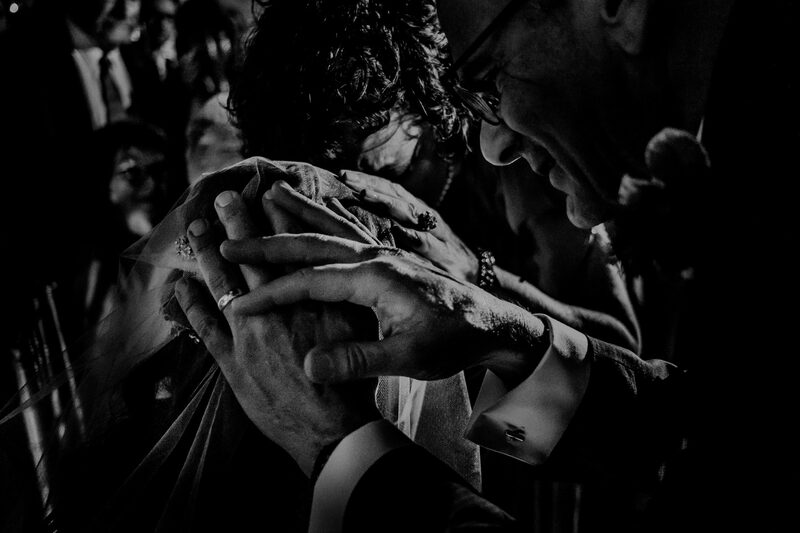 My hope is that you’ll feel these passionate moments through these images also! 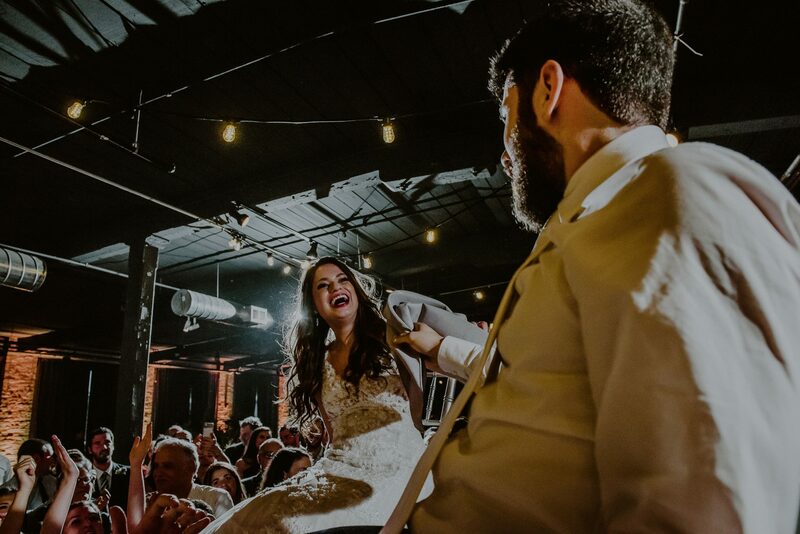 I’d like to extend a big thank you to my 2nd photographer and assistant for the day, Danilo Morales, and Gaby Fuentes, without whom I could not have captured such an amazing wedding! 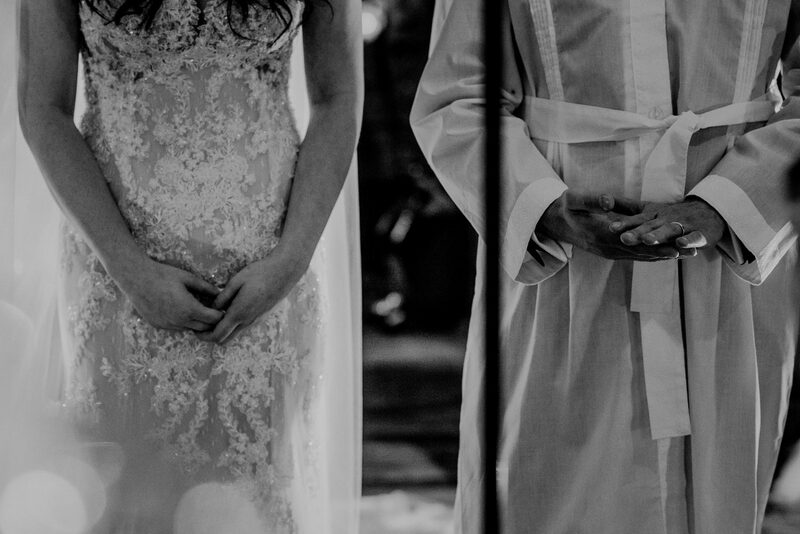 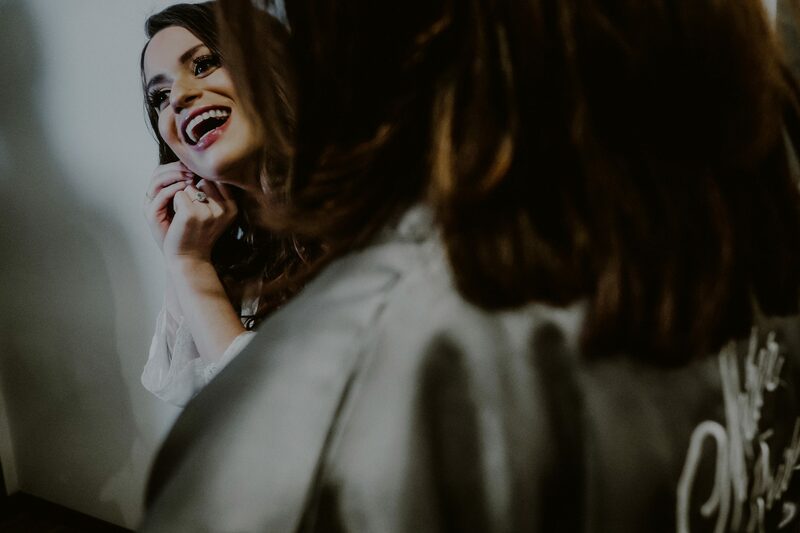 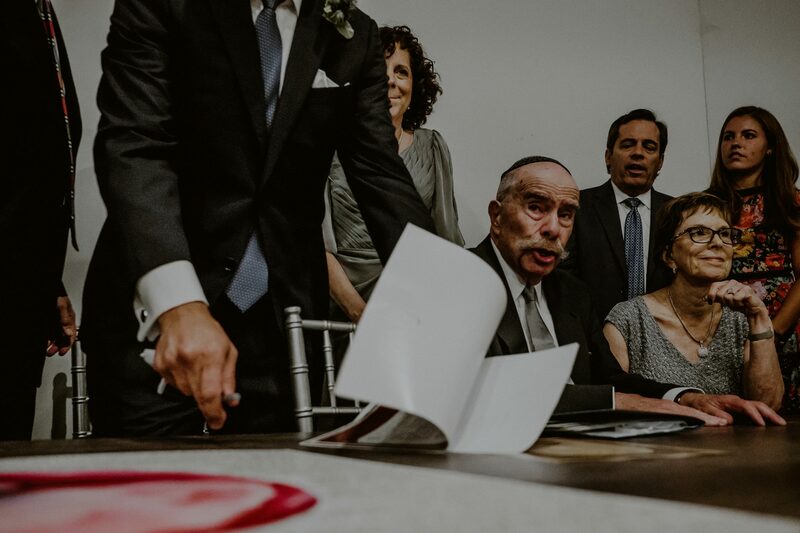 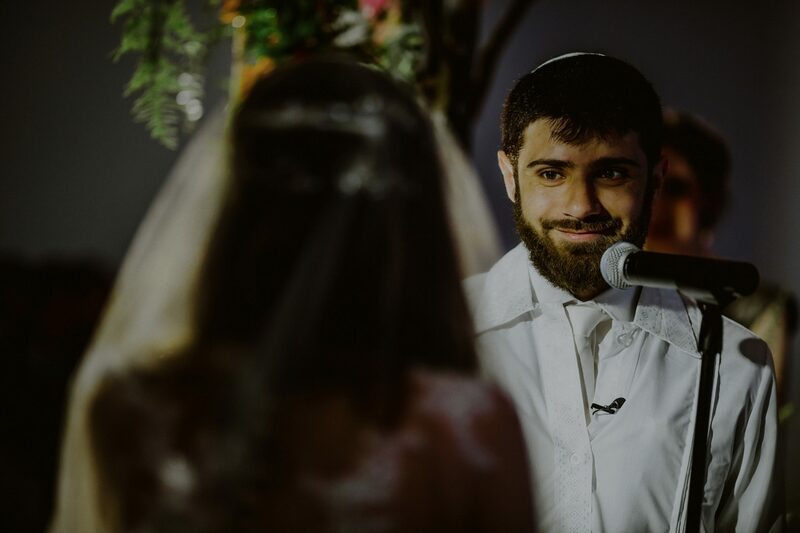 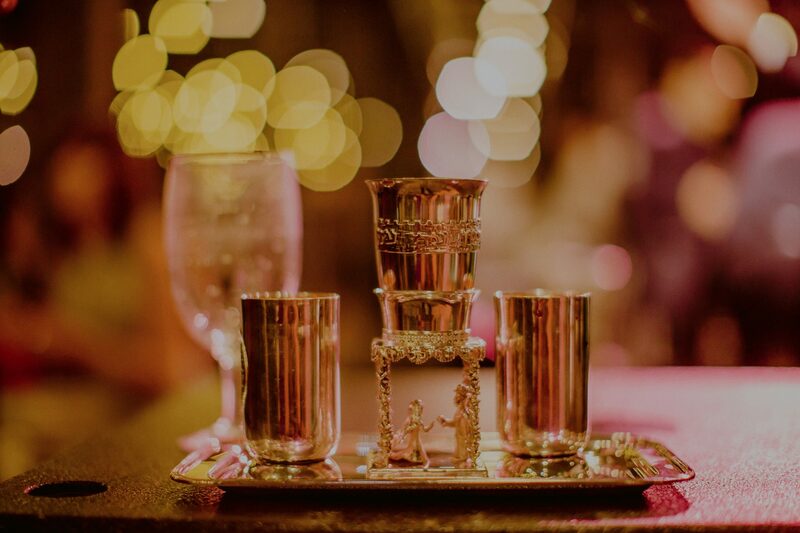 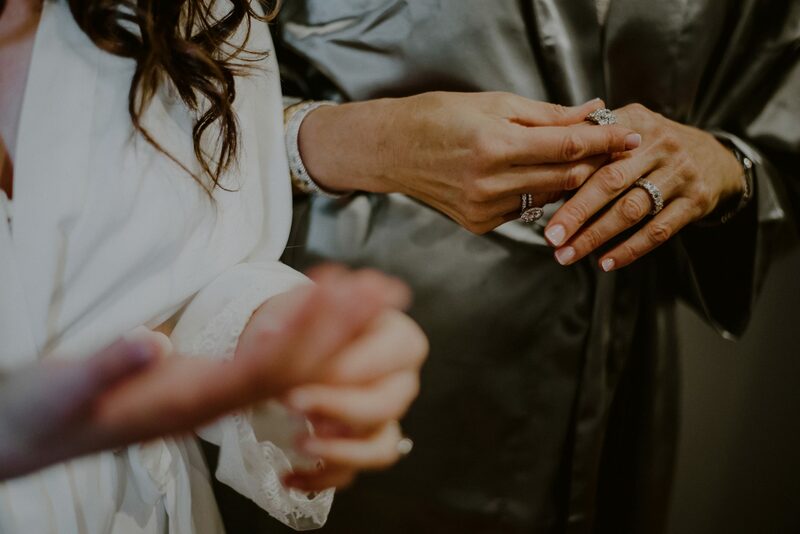 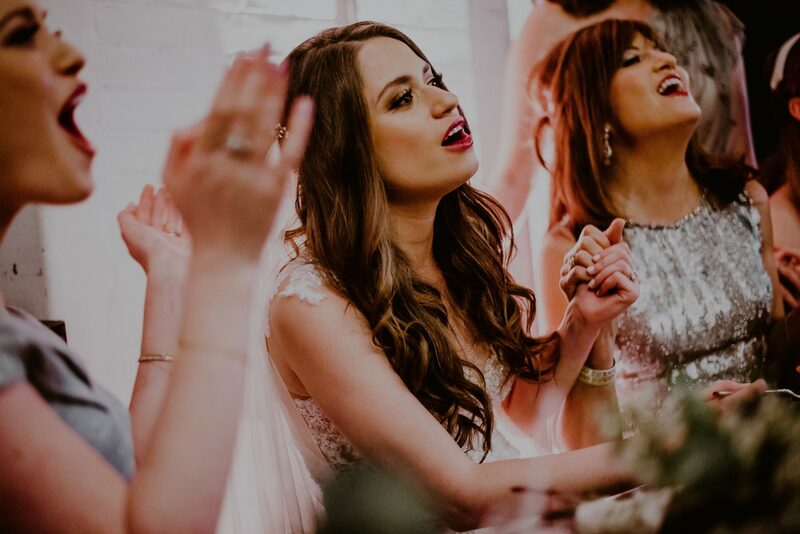 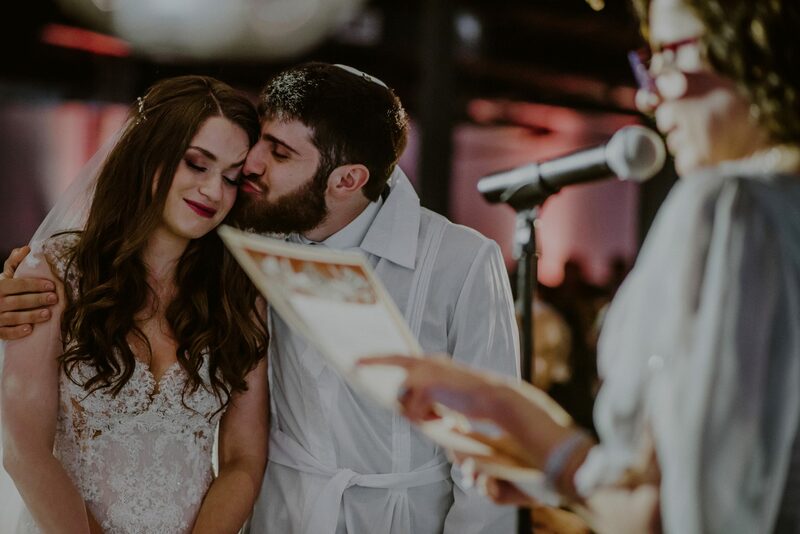 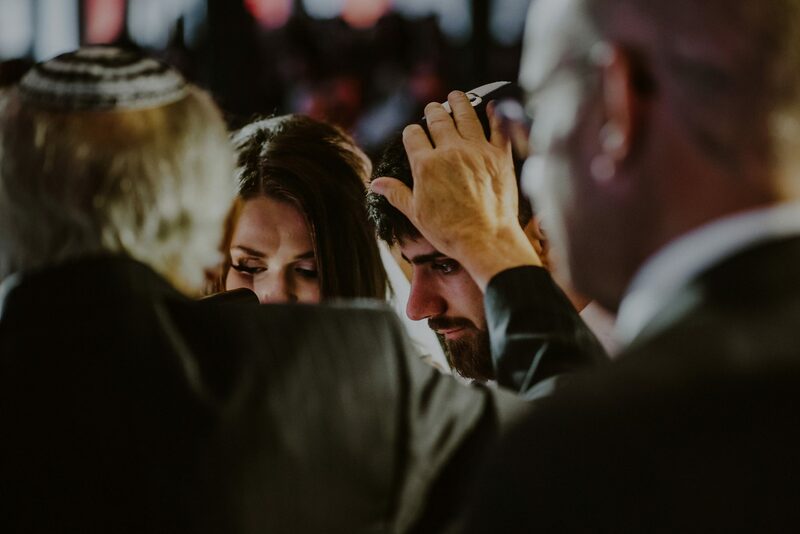 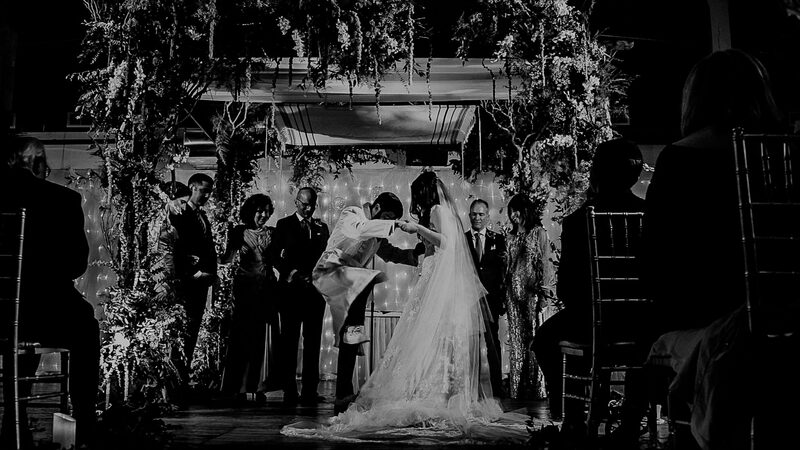 If you enjoyed this and other Jewish weddings, check out this other amazing Orthodox Jewish wedding at the Rockleigh Country Club! 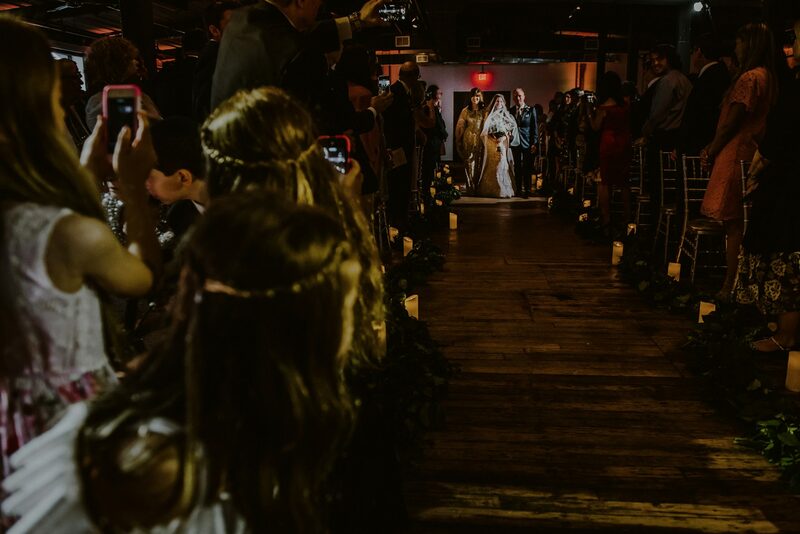 Also, if you love industrial wedding venues, here’s a great wedding at the Art Factory in Paterson, NJ!